Journal of the House of Lords Volume 30, 1760-1764. Originally published by His Majesty's Stationery Office, London, 1767-1830. Epus. Exon. Ds. Henley, Cancellarius. Viscount Weymouth. Ds. Le Despencer. Mr. Strutt to officiate as Clerk Assistant for this Day. The Lord Chancellor acquainted the House, "That Mr. Wight, their Lordships Clerk Assistant, was, by Sickness, prevented from attending the Service of the House." Whereupon, Ordered, That Mr. Samuel Strutt, who hath officiated as Reading Clerk during this Session, be permitted to execute the Office of Clerk Assistant, for the said Mr. Wight, for this Day. Bank of England to purchase Houses, Bill. The Lord Sandys reported from the Lords Committees to whom the Bill, intituled, "An Act to enable the Governor and Company of the Bank of England to purchase Houses and Ground, for opening a Passage for Carriages from Cornhill to The Bank, and making more commodious several other Passages leading thereto; and for enlarging the Buildings of the said Bank, and making the same more commodious," was committed: "That they had considered the said Bill, and examined the Allegations thereof, which were found to be true; and that the Committee had gone through the Bill, and directed him to report the same to the House, without any Amendment." Spalding High Bridge, Road Bill. Hodie 3a vice lecta est Billa, intituled, "An Act for repairing and widening the Roads from the High Bridge in Spalding to a certain Place called Tydd Goat in the County of Lincoln, and from Sutton Saint Mary's to Sutton Wash in the said County." Hodie 3a vice lecta est Billa, intituled, "An Act to enable the Governor and Company of the Bank of England to purchase Houses and Ground, for opening a Passage for Carriages from Cornhill to The Bank, and making more commodious several other Passages leading thereto; and for enlarging the Buildings of the said Bank, and making the same more commodious." His Majesty, being seated on the Throne, adorned with His Crown and Regal Ornaments, and attended by His Officers of State (the Lords being in their Robes), commanded the Gentleman Usher of the Black Rod to let the Commons know, "It is His Majesty's Pleasure, they attend Him immediately, in this House:"
"1. An Act for naturalizing his Highness Charles William Ferdinand, Hereditary Prince of Brunswick Lunenburg." "2. An Act to explain and amend such Part of an Act made in the last Session of Parliament (intituled, An Act for granting to His Majesty several additional Duties upon Wines imported into this Kingdom; and certain Duties upon all Cyder and Perry; and for raising the Sum of Three Millions Five Hundred Thousand Pounds, by Way of Annuities and Lotteries, to be charged on the said Duties") as relates to Cyder and Perry made in this Kingdom." "3. An Act for the Regulation of His Majesty's Marine Forces while on Shore." "4. An Act to continue, for a limited Time, the free Importation of Tallow, Hogs Lard, and Grease, from Ireland." "5. 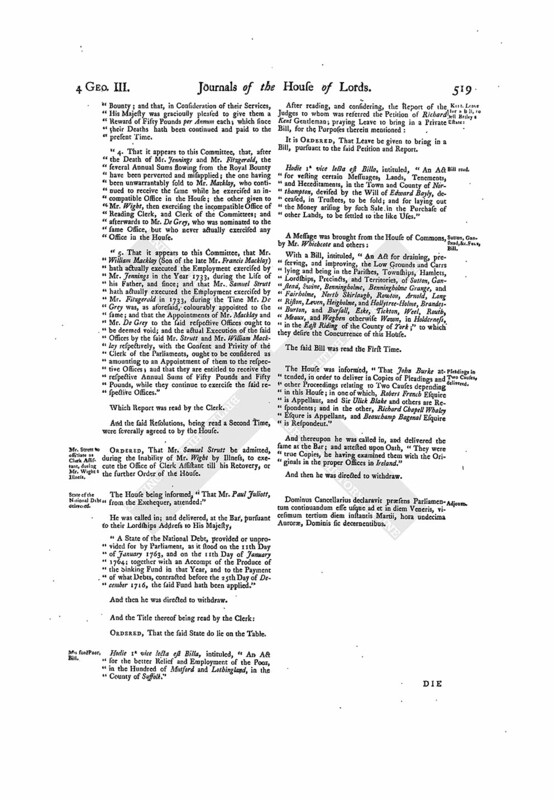 An Act for continuing and enlarging the Term and Powers of an Act, made in the Twenty-sixth Year of the Reign of His late Majesty King George the Second, intituled, An Act for repairing and widening the Road from the West End of the Town of Burton upon Trent in the County of Stafford, through the said Town, to the South End of the Town of Derby in the County of Derby." "6. An Act for repairing and widening several Roads leading from Callington, in the County of Cornwall." "7. 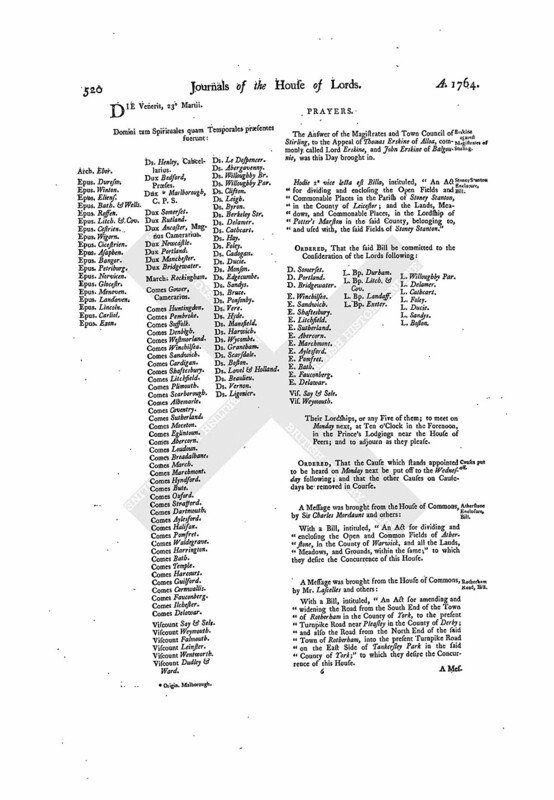 An Act to amend and render more effectual several Acts of Parliament, for repairing the Roads from Sherbrooke Hill near Buxton and Chappell in the Frith in the County of Derby, through the Town of Stockport in the County of Chester, to Manchester in the County of Lancaster, and other Roads in the said Acts mentioned; and for turning and diverting the Roads from Whaley Bridge to Chappel in the Frith and to Sparrow Pit Gate, and from Whaley Bridge to the Western End of Longside Common in the County of Chester." "8. An Act for repairing and widening the Roads from the End of Stanbridge Lane near a Barn in the Parish of Romsey to the Turnpike Road at Middle Wallop, and from the Turnpike Road between Stanbridge Lane aforesaid and Great Bridge to the Turnpike Road at Stockbridge, and from the Garden of Henry Hattat at Awbridge to the Garden Wall of Denys Rolle Esquire at East Tuderley, and from Lockerley Mill Stream to East Dean Gate, and from the said Garden Wall to the Turnpike Road leading from Stockbridge aforesaid, in the County of Southampton, to Salisbury." "9. 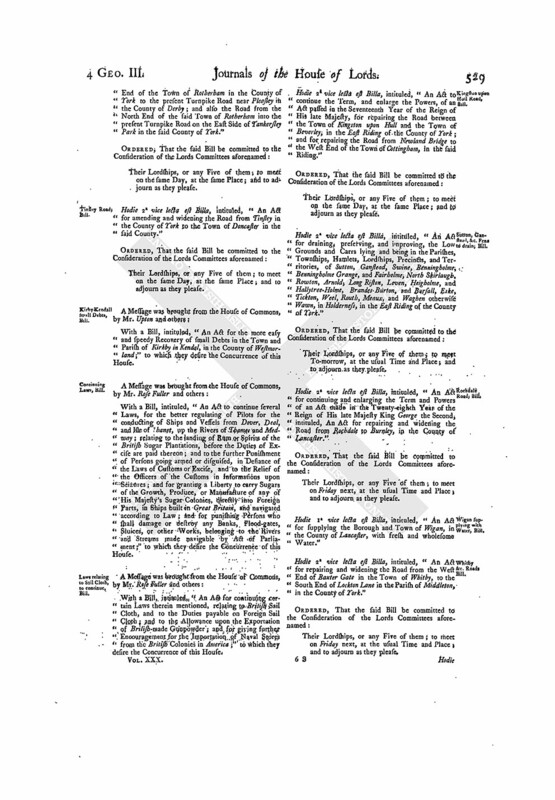 An Act for repairing and widening the Roads from Horsham in the County of Sussex, through the Parishes of Shipley, West Grinsted, Ashurst, Steyning, Bramber, and Breeding, in the said County." "10. An Act for repairing and widening the Road from Worksop in the County of Nottingham, through the Towns of Galeforth, Anston, Aston, Handsworth, and Darnall, to the North East End of Attercliffe in the County of York, where the same joins the Turnpike Road from Bawtry to Sheffield." "11. An Act for repairing and widening the Roads from the High Bridge in Spalding to a certain Place called Tydd Goat in the County of Lincoln, and from, Sutton Saint Mary's to Sutton Wash in the said County." "12. An Act for maintaining, regulating, and employing, the Poor within the Parish of Saint John at Hackney, in the County of Middlesex; and for lighting the said Parish, and establishing a regular Nightly Watch therein." "13. An Act to continue an Act passed in the Tenth Year of the Reign of His late Majesty King George the Second, for continuing an Act passed in the Fifth Year of the Reign of His late Majesty King George the First, intituled, An Act for laying a Duty of Two Pennies Scots, or One Sixth Part of a Penny Sterling, upon every Pint of Ale or Beer that shall be vended or sold within the Town of Dunbar; for improving and preserving the Harbour, and repairing the Town-house, and building a School and other public Buildings there; and for supplying the said Town with fresh Water." "14. An Act to enable the Governor and Company of the Bank of England to purchase Houses and Ground, for opening a Passage for Carriages from Cornhill to The Bank, and making more commodious several other Passages leading thereto; and for enlarging the Buildings of the said Bank, and making the same more commodious." "15. An Act for dividing and enclosing the Open and Common Fields, Common Meadows, and other Commonable Lands, in the Parish of Heckington, in the County of Lincoln." "16. An Act for dividing and enclosing the Open and Common Fields, Common Meadows, Common Grounds, Heath Grounds, Lanes, and Waste Ground, within Guilsborough, Coton, and Nortoft, in the County of Northampton." "17. An Act for dividing and enclosing certain Open Common Fields and Grounds in the Manor and Parish of Stainton in the Hole, in the County of Lincoln." "18. An Act for dividing and enclosing the Common Fields, Common and Waste Grounds, in the Parish of Searby, in the County of Lincoln." "19. An Act for dividing and enclosing the Open and Common Fields, and Commons or Waste Grounds, in the Parish of Chilvers Coton, in the County of Warwick." "20. 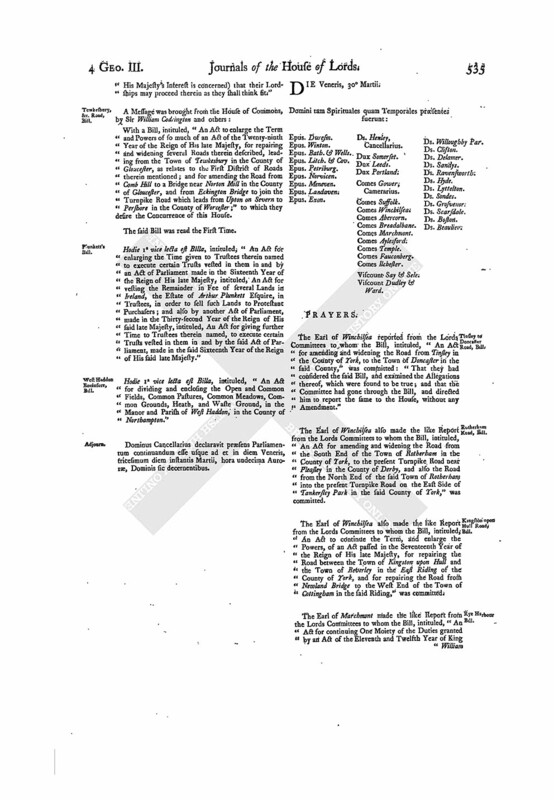 An Act for enclosing and dividing so much of the Moor, or Common, called Badley Moor, as lies within the Manors of North Tuddenham alias Saint Clares, Mattishall Tuddenham, on the Part of North Tuddenham and Bell-house Hall, and in the Parish of North Tuddenham, in the County of Norfolk, and certain other Commons and Wastes within the said Manors and Parish." "21. An Act for dividing and enclosing the Open and Common Fields, Meadows, and Common Fen, in the Parish of Horbling, in the County of Lincoln; and for draining and improving the said Fen." "22. An Act for dividing and enclosing the Open Fields and Commonable Places of and in Billesdon, in the County of Leicester." "23. 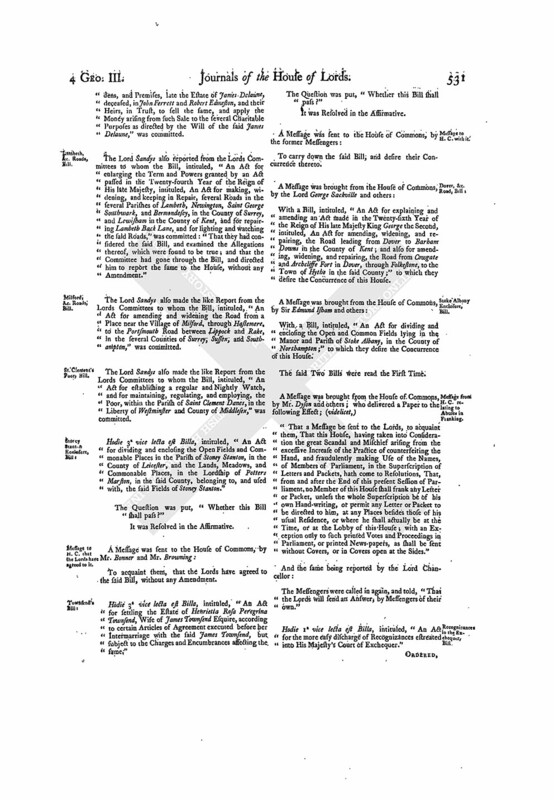 An Act for establishing and confirming the Enclosure and Division of certain Lands in Sudcoates, in the Parish of Drypool, in the County of York; and for other Purposes." "24. An Act for dividing and enclosing several Common and Open Fields and Meadows in the Parish of Saint Margaret; near the Borough of Leicester, in the County of Leicester." "25. An Act for dividing and enclosing the Open and Common Fields of Wartnaby, in the County of Leicester, and all the Lands and Grounds within the same Fields." "26. An Act for dividing and enclosing the Open and Common Fields, Meadows, and Pastures, of North Cave, in the East Riding of the County of York." "27. An Act for confirming Articles of Agreement, for enclosing and dividing several Open Fields, and several Pieces or Parcels of Arable, Meadow, and Pasture Ground, within the Township of Skipsea, in the County of York." "28. An Act for dividing and enclosing the Open and Common Fields and Grounds in the Township and Parish of Skeffling in Holderness, in the County of York." "29. An Act for extinguishing the Right of Common in, over, and upon, certain Commonable Lands and Grounds within the Manor and Parish of Bromley, in the County of Kent." "30. An Act for exempting Batchacre Grange, in the Counties of Stafford and Salop, or One of them, from Payment of Tithes and other Ecclesiastical Dues; and for settling other Tithes in Lieu thereof." "31. An Act for draining certain Fen Lands and Wet Grounds in the Parish of Helgay, in the County of Norfolk." "32. An Act for draining and preserving certain Marsh Lands and Low Grounds within the Township of Thorngumbald, in the County of York." "33. An Act for establishing and carrying into Execution certain Articles of Agreement therein mentioned, for a Division of certain Real Estates, in the County of York, late of Sir Hungerford Bland Baronet, deceased; and for other Purposes therein mentioned." "34. An Act for empowering the Committee or Committees, for the Time being, of the Estate of John Newport Esquire, a Lunatick, to make Leases of his Estates during his Lunacy." "35. An Act for carrying into Execution an Agreement between the Governors and Guardians of the Hospital for the Maintenance and Education of Exposed and Deserted Young Children, and Robert Nedham Esquire, deceased, relating to an Estate in the Island of Jamaica, devised by the Will of Henry Nedham Esquire, deceased." "36. An Act for annexing the Rectory of East Lockinge, in the County of Berks, to the Office of Warden of the College of The Souls of All faithful People deceased, of Oxford." "37. An Act for Sale of the Freehold and Leasehold Estates of John Tregenna Clerk, deceased, in the County of Cornwall, given and devised by his Will, in Trust, for his Children; and for paying and applying the Money to arise by such Sale in Manner therein mentioned." "38. An Act to enable the Vicar of the Parish of Rochdale, in the County of Lancaster, to grant a Lease or Leases of the Glebe Lands belonging to the said Vicarage." "39. An Act to enable the Rector of the Parish and Parish Church of Bury, in the County of Lancaster, for the Time being, to grant Leases of the Glebe belonging to the said Rectory." "40. An Act for making the Exemplisication of the Will of Thomas King Esquire, deceased, Evidence in all Courts of Law and Equity in Great Britain and Ireland." "41. An Act to enable Richard Symons, an Infant (lately called Richard Peers), and the Heirs of his Body, to take and use the Surname of Symons, pursuant to the Will of Richard Symons Esquire, deceased." "42. An Act for naturalizing William Dingman and John Reincke." "43. An Act for naturalizing John Martelihe of London Merchant." "44. An Act for naturalizing Egbert Nonnen." Visc. Townshend takes his Seat. This Day George Viscount Townshend sat first in Parliament, after the Death of his Father Charles Viscount Townshend; his Lordship having first, at the Table, taken the Oaths, and made and subscribed the Declaration, and also taken and subscribed the Oath of Abjuration, pursuant to the Statutes. Colneis and Carlford Poor, Bill. With a Bill, intituled, "An Act to amend and render more effectual an Act passed in the Twenty-ninth Year of the Reign of His late Majesty King George the Second, intituled, "An Act for the better Relief and Employment of the Poor in the Hundreds of Colneis and Carlford, in the County of Suffolk;" to which they desire the Concurrence of this House. With a Bill, intituled, "An Act for the better Relief and Employment of the Poor in the Hundred of Blything, in the County of Suffolk;" to which they desire the Concurrence of this House." Alfreton, Mansfield, &c. Roads, Bill. With a Bill, intituled, "An Act for repairing, widening, and keeping in Repair, the High Roads leading from Alfreton in the County of Derby, through Carter's Lane, to a certain Place in the Town of Mansfield called Stockwell, and from the Bridle Gate at the Division of the Liberties of Blackwell and Hucknall, through the Town of Sutton in Ashfield, to the Mansfield and Newark Turnpike, at or near Python Hill in the Forest of Sherwood in the County of Nottingham;" to which they desire the Concurrence of this House. Rochdale to Burnley, Road Bill. With a Bill, intituled, "An Act for continuing and enlarging the Term and Powers of an Act, made in the Twenty-eighth Year of the Reign of His late Majesty King George the Second, intituled, An Act for repairing and widening the Road from Rochdale to Burnley, in the County of Lancaster;" to which they desire the Concurrence of this House." The said Four Bills were severally read the First Time. The Earl of Aylesford reported from the Lords Committees to whom the Bill, intituled, "An Act to empower the Guardians of George Earl of Egremont, an Infant, to enfranchise certain Customary Lands and Hereditaments, in the County of Cumberland, Part of the settled Estates of the said Earl; and also to empower the Guardians of the said Earl, and his Infant Brothers, to make Leases of Part of the said Estate, in the County of Cumberland, and to make Leases and Copyhold Grants of the several Estates limited and devised to them respectively by Charles Earl of Egremont, their late Father, deceased; and for other the Purposes therein mentioned," was committed: "That they had considered the said Bill, and examined the Allegations thereof, which were found to be true; that the Parties concerned had given their Consents, to the Satisfaction of the Committee; and that the Committee had gone through the Bill, and directed him to report the same to the House, without any Amendment." 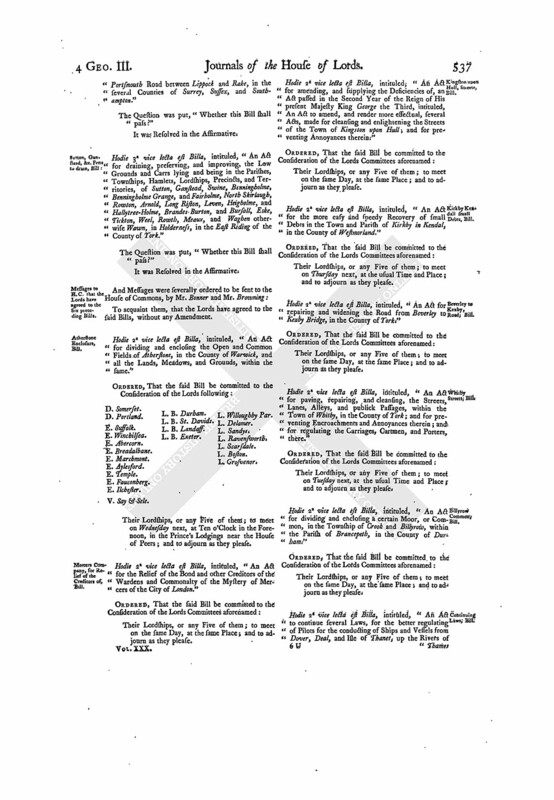 Hodie 2a vice lecta est Billa, intituled, "An Act for dividing and enclosing the Open and Common Fields, Common Meadows, Lammas Grounds, and other Commonable Lands and Grounds, in the Parish of Fotherby, in the County of Lincoln." Vis. Weymouth. L. Bp. Litch. & Cov. L. Bp. Exeter. L. Abergavenny. Their Lordships, or any Five of them; to meet on Tuesday next, at Ten o'Clock in the Forenoon, in the Prince's Lodgings near the House of Peers; and to adjourn as they please. Hodie 2a vice lecta est Billa, intituled, "An Act for dividing and enclosing a Moor, or Common, called Staindrop Moor, within the Township of Staindrop, in the County of Durham." With a Bill, intituled, "An Act for dividing, allotting, and enclosing, the Open Fields and Pasture Grounds in the Lordships of Aldbrough in Holderness, in the County of York;" to which they desire the Concurrence of this House. Carter to take the Name of Pollard, Bill. Hodie 2a vice lecta est Billa, intituled, "An Act to enable John Pollard Esquire (lately called John Carter), and his Heirs Male, to take and use the Surname and Arms of Pollard, pursuant to the Will of Elizabeth Pollard, deceased." Hodie 1a vice lecta est Billa, intituled, "An Act for the better Relief and Employment of the Poor in the Hundred of Wangford, in the County of Suffolk." 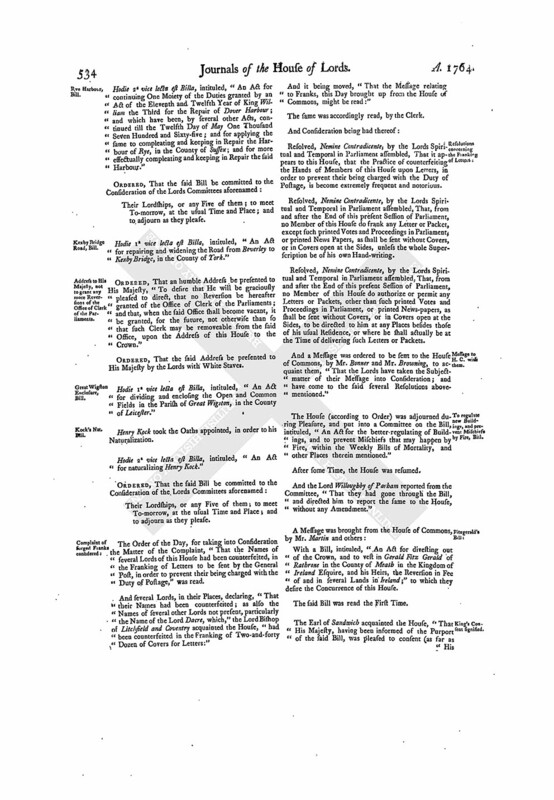 Appointment of the Clerks, Report concerning: and Resolutions thereon. "That the Committee have met, and have inspected the Journals as to former Proceedings of the House in relation to their Clerks; and have also inspected the Clerk of the Parliaments Patent, bearing Date the First Year of the Reign of His late Majesty King George the First, by which he is empowered to execute his said Office by himself, or by sufficient Deputy or Deputies; and were informed, that there has been made a Reversionary Grant of the said Office for another Life, but the same was not produced to the Committee. "That the several Appointments, referred to the Committee, were read. "That the Committee did examine the Clerk Assistant, as to the Manner of executing the Business by the Clerks attending the House, and at the Parliament-office; upon whose Examination, it appeared that the Clerk of the Parliaments, the Clerk Assistant, and the Reading Clerk, attend in the House, and are entitled to Fees, according to a Table of Fees, which was settled by the House in 1725, and is printed; and by several Resolutions made upon Report from a Committee appointed to consider Part of the said Table of Fees in 1756, which are likewise printed; and that there are Two Out Clerks employed in the Parliament-office, one to make up the Journal from the Minute Book, and to deliver out the Orders of the House, and the other to make out, and deliver out Copies of Acts of Parliament, Appeals, and other Proceedings of the House; and that other Persons are taken in occasionally as Writers, who are allowed the usual Pay of the Office for what they write. "That it appeared, by an Entry in the Journal of the 5th of June 1733, that, upon reading the Petition of John Jennings, One of the said Out Clerks; setting forth, That he hath been a long Time employed in transcribing the Proceedings of this House, and was directed by the Clerk of the Parliaments to make Indexes, and supply the Omission of Marginal Notes in their Lordships Journals; and was, in the Year 1718, appointed to carry on, and keep from Time to Time, the Journal of the House, which Service the Petitioner hath attended with the utmost Care and Diligence; and praying, in regard he hath not any settled Reward, that he may be recommended to His Majesty, for His Royal Bounty, in Consideration of his Services, in such Manner as may be thought proper; and that an Order was made, that the Petitioner be recommended to His Majesty by the Lord Chancellor, according to the Prayer of his Petition. "And that, by another Entry in the Journal, of the 12th of June 1733, upon the Petition of Edmund Fitzgerald, then the other of the said Out-Clerks; praying, in regard the Services of others of the Clerks have been considered, and the Petitioner having been employed in the Parliament-office upwards of 18 Years, and having no Fees, that his Services may be also considered; and that an Order was made, that the Petitioner be also recommended by the Lord Chancellor to His Majesty for His Royal Bounty, in Consideration of his Services. "That, in Consequence of the said Recommendations, His Majesty was graciously pleased to order the Annual Sum of Fifty Pounds to be paid to each of the Petitioners respectively, which was constantly paid to them during their respective Lives. "That, upon the Death of the said Mr. Fitzgerald, Mr. Wight was appointed by the late Clerk of the Parliaments to succeed him; in Consequence of which Appointment, he received His Majesty's said Royal Bounty; and that, upon the Death of Mr. Jennings, the late Clerk of the Parliaments appointed Mr. Francis Macklay to succeed to the said Office of Clerk for making up the Journal and delivering out the Orders; for which Appointment, it appeared, by Evidence produced to the Committee, that the said Mr. Macklay paid the Sum of Three Hundred Pounds. "That, it appeared also to the Committee, that, upon the Death of Mr. Merest, the late Clerk Assistant, the present Clerk of the Parliaments appointed Mr. De Grey to succeed to that Office; which Appointment was, by Order of the House, referred to a Committee, to take the same into Consideration. "That it appeared that the said Committee did not make any Report upon the said Reference; but that, soon afterwards, the said Clerk of the Parliaments revoked his Appointment of Mr. De Grey to be Clerk Assistant, and appointed Mr. Wight, then Reading Clerk, to that Office, and appointed the said Mr. De Grey to be Reading Clerk and Clerk of the Copies. "That it further appeared that the said Mr. De Grey never executed either of the said Offices in Person, but appointed the late Mr. Macklay, then Clerk of the Journals, to officiate for him, which he continued to do in the House until near the Time of his Death. "That it further appeared, that Mr. Samuel Strutt, who was brought into the Parliament-office by Mr. Wight in the Year 1753, hath executed the Office of Clerk of the Copies (given to Mr. De Grey) from his Introduction into the said Office, and doth still execute the same, without having received any Part of the Royal Bounty, obtained by the House as aforesaid for the Person executing that Office; and that Mr. William Macklay, who was brought into the Office by his Father Mr. Francis Macklay, hath executed the Office of Clerk of the Journals from the Time of his Introduction into the said Office, and doth still execute the same, without having received any Part of the said Royal Bounty. "That the Committee did also examine Mr. Mathew Robert Arnott, appointed by the present Clerk of the Parliaments to be Reading Clerk, as to his Sufficiency for the Execution of the said Office, and as to his Intention of executing the same in Person (provided he should be approved of by the House); and that the said Mr. Arnott engaged before the Committee to execute the said Office in Person. "That the Committee then examined the said Mr. Arnott, whether he had given, or promised to give, to any Person or Persons, any pecuniary Consideration, in any Shape whatsoever, for the said Office? and that the said Mr. Arnott declared to the Committee, that he hath not made any such Promise; nor hath he given, nor is he to give, directly or indirectly, any pecuniary Consideration for the said Office, to any Person or Persons whatsoever. "1. That it appears to this Committee, that the said Mathew Robert Arnott, appointed by Ashley Cowper Esquire, Clerk of the Parliaments, to be Reading Clerk, is a sit and sufficient Person to execute the said Office. "2. That it appears to this Committee, that, in the Year 1733, the Clerks of this House were, the Clerk of the Parliaments, the Clerk Assistant, and the Reading Clerk, who were entitled to Fees; Mr. Jennings, who was employed in keeping and carrying on the Journals, and in transcribing the Proceedings of the House; Mr. Fitzgerald, who was employed in other Business of the Office; neither of whom had before that Time any settled Reward. "That it appears to this Committee, that, in the said Year, the said Two last-mentioned Persons were recommended by the House to His late Majesty's Bounty; and that, in Consideration of their Services, His Majesty was graciously pleased to give them a Reward of Fifty Pounds per Annum each; which since their Deaths hath been continued and paid to the present Time. "4. That it appears to this Committee, that, after the Death of Mr. Jennings and Mr. Fitzgerald, the several Annual Sums flowing from the Royal Bounty have been perverted and misapplied; the one having been unwarrantably sold to Mr. Macklay, who continued to receive the same while he exercised an incompatible Office in the House; the other given to Mr. Wight, then exercising the incompatible Office of Reading Clerk, and Clerk of the Committees; and afterwards to Mr. De Grey, who was nominated to the same Office, but who never actually exercised any Office in the House. "5. That it appears to this Committee, that Mr. William Macklay (Son of the late Mr. Francis Macklay) hath actually executed the Employment exercised by Mr. Jennings in the Year 1733, during the Life of his Father, and since; and that Mr. Samuel Strutt hath actually executed the Employment exercised by Mr. Fitzgerald in 1733, during the Time Mr. De Grey was, as aforesaid, colourably appointed to the same; and that the Appointments of Mr. Macklay and Mr. De Grey to the said respective Offices ought to be deemed void; and the actual Execution of the said Offices by the said Mr. Strutt and Mr. William Macklay respectively, with the Consent and Privity of the Clerk of the Parliaments, ought to be considered as amounting to an Appointment of them to the respective Offices; and that they are entitled to receive the respective Annual Sums of Fifty Pounds and Fifty Pounds, while they continue to exercise the said respective Offices." Which Report was read by the Clerk. And the said Resolutions, being read a Second Time, were severally agreed to by the House. Mr. Strutt to officiate as Clerk Assistant, during Mr. Wight's Illness. Ordered, That Mr. Samuel Strutt be admitted, during the Inability of Mr. Wight by Illness, to execute the Office of Clerk Assistant till his Recovery, or the further Order of the House. The House being informed, "That Mr. Paul Juliott, from the Exchequer, attended:"
"A State of the National Debt, provided or unprovided for by Parliament, as it stood on the 11th Day of January 1763, and on the 11th Day of January 1764; together with an Accompt of the Produce of the Sinking Fund in that Year, and to the Payment of what Debts, contracted before the 25th Day of December 1716, the said Fund hath been applied." Ordered, That the said State do lie on the Table. Hodie 1a vice lecta est Billa, intituled, "An Act for the better Relief and Employment of the Poor, in the Hundred of Mutford and Lothingland, in the County of Suffolk." Hodie 1a vice lecta est Billa, intituled, "An Act for vesting certain Messuages, Lands, Tenements, and Hereditaments, in the Town and County of Northampton, devised by the Will of Edward Bayly, deceased, in Trustees, to be sold; and for laying out the Money arising by such Sale in the Purchase of other Lands, to be settled to the like Uses." Sutton, Ganstead, &c. Fens, Bill. With a Bill, intituled, "An Act for draining, preserving, and improving, the Low Grounds and Carrs lying and being in the Parishes, Townships, Hamlets, Lordships, Precincts, and Territories, of Sutton, Ganstead, Swine, Benningholme, Benningholme Grange, and Fairholme, North Skirlaugh, Rowton, Arnold, Long Riston, Leven, Heigholme, and Hallytree-Holme, BrandesBurton, and Bursall, Eske, Tickton, Weel, Routh, Meaux, and Waghen otherwise Wawn, in Holderness, in the East Riding of the County of York;" to which they desire the Concurrence of this House. Pleadings in Two Causes, delivered. The House was informed, "That John Burke attended, in order to deliver in Copies of Pleadings and other Proceedings relating to Two Causes depending in this House; in one of which, Robert French Esquire is Appellant, and Sir Ulick Blake and others are Respondents; and in the other, Richard Chapell Whaley Esqure is Appellant, and Beauchamp Bagenal Esquire is Respondent." And thereupon he was called in, and delivered the same at the Bar; and attested upon Oath, "They were true Copies, he having examined them with the Originals in the proper Offices in Ireland." Dominus Cancellarius declaravit præsens Parliamentum continuandum esse usque ad et in diem Veneris, vicesimum tertium diem instantis Martii, hora undecima Auroræ, Dominis sic decernentibus. Dux (fn. 1) Marlborough, C. P. S.
Viscount Dudley & Ward. Ds. Le Despencer. Erskine against Magistrates of Stirling. The Answer of the Magistrates and Town Council of Stirling, to the Appeal of Thomas Erskine of Alloa, commonly called Lord Erskine, and John Erskine of Balgounie, was this Day brought in. Hodie 2a vice lecta est Billa, intituled, "An Act for dividing and enclosing the Open Fields and Commonable Places in the Parish of Stoney Stanton, in the County of Leicester; and the Lands, Meadows, and Commonable Places, in the Lordship of Potter's Marston in the said County, belonging to, and used with, the said Fields of Stoney Stanton." Vis. Weymouth. L. Bp. Durham. L. Bp. Litch. & Cov. L. Bp. Exeter. L. Willoughby Par. Their Lordships, or any Five of them; to meet on Monday next, at Ten o'Clock in the Forenoon, in the Prince's Lodgings near the House of Peers; and to adjourn as they please. Ordered, That the Cause which stands appointed to be heard on Monday next be put off to the Wednesday following; and that the other Causes on Causedays be removed in Course. With a Bill, intituled, "An Act for dividing and enclosing the Open and Common Fields of Atherstone, in the County of Warwick, and all the Lands, Meadows, and Grounds, within the same;" to which they desire the Concurrence of this House. With a Bill, intituled, "An Act for amending and widening the Road from the South End of the Town of Rotherham in the County of York, to the present Turnpike Road near Pleasley in the County of Derby; and also the Road from the North End of the said Town of Rotherham, into the present Turnpike Road on the East Side of Tankersley Park in the said County of York;" to which they desire the Concurrence of this House. Recognizances, more easy Discharge of, Bill. With a Bill, intituled, "An Act for the more easy Discharge of Recognizances estreated into His Majesty's Court of Exchequer;" to which they desire the Concurrence of this House. With a Bill, intituled, "An Act for enlarging the Time given to Trustees, therein named, to execute certain Trusts vested in them in and by an Act of Parliament made in the Sixteenth Year of the Reign of His late Majesty, intituled, An Act for vesting the Remainder in Fee of several Lands in Ireland, the Estate of Arthur Plunkett Esquire, in Trustees, in order to sell such Lands to Protestant Purchasers; and also by another Act of Parliament, made in the Thirty-second Year of the Reign of His said late Majesty, intituled, An Act for giving further Time to Trustees, therein named, to execute certain Trusts vested in them in and by the said Act of Parliament made in the said Sixteenth Year of the Reign of His said late Majesty;" to which they desire the Concurrence of this House. Wigan to supply with Water, Bill. With a Bill, intituled, "An Act for supplying the Borough and Town of Wigan, in the County of Lancaster, with fresh and wholesome Water;" to which they desire the Concurrence of this House. Whitby to Lockton Lane, Bill. With a Bill, intituled, "An Act for repairing and widening the Road from the West End of Baxter Gate in the Town of Whitby, to the South End of Lockton Lane in the Parish of Middleton, in the County of York;" to which they desire the Concurrence of this House. St. Clement's Danes, Poor, Bill. With a Bill, intituled, "An Act for establishing a regular and Nightly Watch, and for maintaining, regulating, and employing, the Poor, within the Parish of Saint Clement Danes, in the Liberty of Westminster, and County of Middlesex;" to which they desire the Concurrence of this House. With a Bill, intituled, "An Act for paying, repairing, and cleansing, the Streets, Lanes, Alleys, and Public Passages, within the Town of Whitby, in the County of York; and for preventing Encroachments and Annoyances therein; and for regulating the Carriages, Cartmen, and Porters, there;" to which they desire the Concurrence of this House. Dominus Cancellarius declaravit præsens Parliamentum continuandum esse usque ad et in diem Lunæ, vicesimum sextum diem instantis Martii, hora undecima Auroræ, Dominis sic decernentibus. Dux Marlborough, C. P. S.
E of Macclesfield takes his Seat. This Day Thomas Earl of Macclesfield sat first in Parliament, after the Death of his Father George Earl of Macclesfield; his Lordship having first, at the Table, taken the Oaths, and made and subscribed the Declaration, and also taken and subscribed the Oath of Abjuration, pursuant to the Statutes. Hodie 3a vice lecta est Billa, intituled, "An Act to empower the Guardians of George Earl of Egremont, an Infant, to enfranchise certain Customary Lands and Hereditaments in the County of Cumberland, Part of the settled Estates of the said Earl; and also to empower the Guardians of the said Earl and his Infant Brothers, to make Leases of Part of the said Estate in the County of Cumberland; and to make Leases and Copyhold Grants of the several Estates limited and devised to them respectively by Charles Earl of Egremont, their late Father, deceased; and for other the Purposes therein mentioned." Bowes and Smart to be heard, by Counsel, against the Staindrop Enclosure, Bill. Upon reading the Petition of Mary Bowes, Widow and Relict of George Bowes Esquire, deceased, on Behalf of herself, and as Guardian to Mary Eleanor Bowes her Infant Daughter; and also, upon reading the Petition of Francis Smart Esquire, Lord of the Manor, or reputed Manor, of Snotterton, in the County of Durham; taking Notice of a Bill depending in this House, intituled, "An Act for dividing and enclosing a Moor, or Common, called Staindrop Moor, within the Township of Staindrop, in the County of Durham;" and alleging, "That the passing thereof, as it now stands, will be a manifest Injury to the Petitioners;" and therefore praying, "That they may be heard, by their Counsel, against such Parts of the said Bill as affect the Property of the Petitioners:"
It is Ordered, That the said Petitions be referred to the Consideration of the Lords Committees to whom the said Bill stands committed; and that the Petitioners be at Liberty to be heard, by their Counsel, against the said Bill, before the said Committee, if they think fit; as may also Counsel be heard for the said Bill, at the same Time. 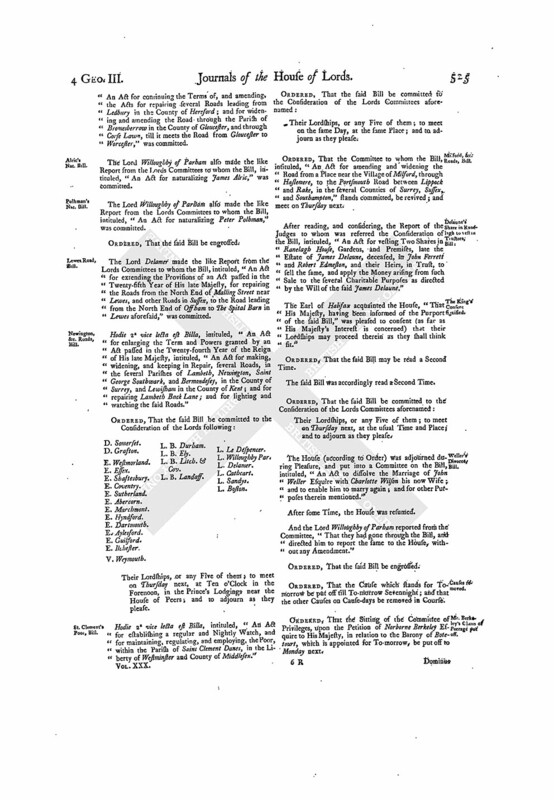 Hodie 1a vice lecta est Billa, intituled, "An Act for establishing a regular and Nightly Watch, and for maintaining, regulating, and employing, the Poor, within the Parish of Saint Clement Danes, in the Liberty of Westminster and County of Middlesex." Hodie 1a vice lecta est Billa, intituled, "An Act for the more effectual Relief and Employment of the Poor, within the City of Gloucester; and for lighting the Streets of the said City." Whitby to Lockton Lane Road, Bill. Hodie 1a vice lecta est Billa, intituled, "An Act for repairing and widening the Road from the West End of Baxter Gate in the Town of Whitby, to the South End of Lockton Lane in the Parish of Middleton, in the County of York." Hodie 2a vice lecta est Billa, intituled, "An Act for dividing and enclosing the Common Fields, Common Pastures, Common Grounds, and Waste Grounds, in the Parish of Ledgers Ashby, in the County of Northampton." V. Weymouth. L. B. Durham. L. B. Exeter. L. Abergavenny. Their Lordships, or any Five of them; to meet To-morrow Sevennight, at Ten o'Clock in the Forenoon, in the Prince's Lodgings near the House of Peers; and to adjourn as they please. Ordered, That the Sitting of the Committee on the Bill, intituled, "An Act for dividing and enclosing a Moor, or Common, called Staindrop Moor, within the Township of Staindrop, in the County of Durham," which stands for To-morrow, be put off to Monday next. The Lord Sandys reported from the Lords Committees to whom the Bill, intituled, "An Act for dividing and enclosing the several Open and Common Fields and Ings within the Township and Parish of Houghton in the Marsh, otherwise Holton in the Clay, in the County of Lincoln," was committed: "That they had considered the said Bill, and examined the Allegations thereof, which were found to be true; that the Parties concerned had given their Consents, to the Satisfaction of the Committee; and that the Committee had gone through the Bill, and directed him to report the same to the House, without any Amendment." Hodie 2a vice lecta est Billa, intituled, "An Act for repairing and widening, and keeping in Repair, the High Roads leading from Alfreton in the County of Derby, through Carter's Lane, to a certain Place in the Town of Mansfield, called Stockwell, and from the Bridle Gate at the Division of the Liberties of Blackwell and Hucknall, through the Town of Sutton in Ashfield, to the Mansfield and Newark Turnpike at or near Python Hill in the Forest of Sherwood in the County of Nottingham." Dominus Cancellarius declaravit præsens Parliamentum continuandum esse usque ad et in diem Martis, vicesimum septimum diem instantis Martii, hora undecima Auroræ, Dominis sic decernentibus. Uckington, and other Roads, Bill. With a Bill, intituled, "An Act for enlarging the Term and Powers of Two Acts, of the Twelfth of King George the First, and of the Third of His late Majesty, for repairing several Roads therein mentioned, in the County of Salop; and also for amending and widening the Road from the Sign of The Horseshoe in Uckington to Longnor Green, and also from the West End of Hatcham Bridge to The Cross Houses upon the Bridgenorth Turnpike Road in the said County;" to which they desire the Concurrence of this House. Message from H. C. to return Beaghan's Bill. To return the Bill, intituled, "An Act for vesting the Estate late of Edmund Hungate Beaghan Esquire, deceased, in the Counties of Kent and Sussex, in Trustees, in Trust, to sell and convey the same to Edward Louisa Mann Esquire, or as he shall appoint, pursuant to an Agreement for that Purpose; and for applying the Money arising by such Sale for the Benefit of George Edmund Beaghan, his only Son and Heir, an Infant;" and to acquaint this House, that they have agreed to the same, without any Amendment. Spalding to Donington, Road, Bill. 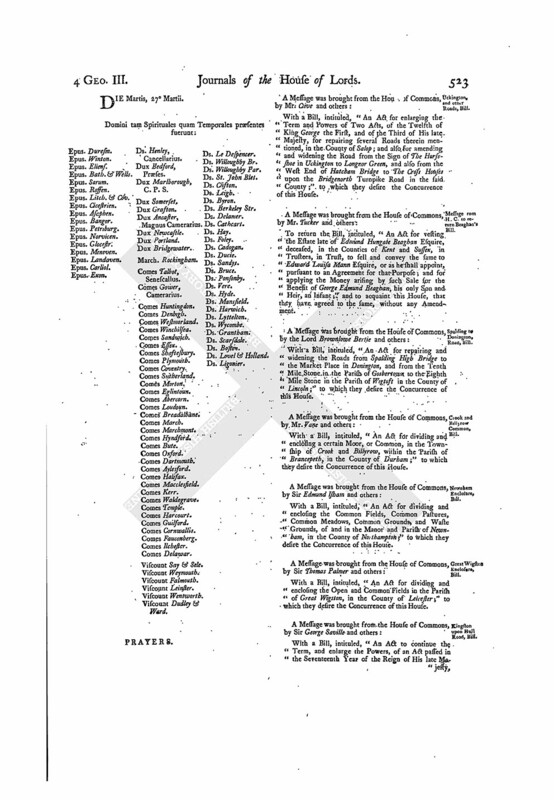 With a Bill, intituled, "An Act for repairing and widening the Roads from Spalding High Bridge to the Market Place in Donington, and from the Tenth Mile Stone in the Parish of Gosbertown to the Eighth Mile Stone in the Parish of Wigtost in the County of Lincoln;" to which they desire the Concurrence of this House. Crook and Billyrow Common, Bill. With a Bill, intituled, "An Act for dividing and enclosing a certain Moor, or Common, in the Township of Crook and Billyrow, within the Parish of Brancepeth, in the County of Durham;" to which they desire the Concurrence of this House. With a Bill, intituled, "An Act for dividing and enclosing the Common Fields, Common Pastures, Common Meadows, Common Grounds, and Waste Grounds, of and in the Manor and Parish of Newnham, in the County of Northampton;" to which they desire the Concurrence of this House. With a Bill, intituled, "An Act for dividing and enclosing the Open and Common Fields in the Parish of Great Wigston, in the County of Leicester;" to which they desire the Concurrence of this House. Kingston upon Hull Road, Bill. With a Bill, intituled, "An Act to continue the Term, and enlarge the Powers, of an Act passed in the Seventeenth Year of the Reign of His late Ma jesty, for repairing the Road between the Town of Kingston upon Hull and the Town of Beverley in the East Riding of the County of York, and for repairing the Road from Newland Bridge to the West End of the Town of Cottingham in the said Riding;" to which they desire the Concurrence of this House. The last-mentioned Bill was read the First Time. Message from H. C. to return Blanch's Bill. To return the Bill, intituled, "An Act for confirming a Partition of several Estates late of Thomas Horton, in the Counties of Wilts and Gloucester, between William Blanch, John Roberts, Richard Brereton, and others; and for vesting and settling the Premises to the several Uses therein mentioned;" and to acquaint this House, that they have agreed to the same, without any Amendment. To return the Bill, intituled, "An Act to empower the Right Honourable John Lord Viscount Spencer to make Leases of the Manor of Battersea and Wandsworth, and of Lands and Grounds in Battersea and Wandsworth, in the County of Surrey, purchased in Pursuance of the Will of the most Noble Sarah late Dutchess Dowager of Marlborough, in order for building upon and improving the same;" and to acquaint this House, that they have agreed to the same, without any Amendment. Bath and Bristol Roads, Bill. 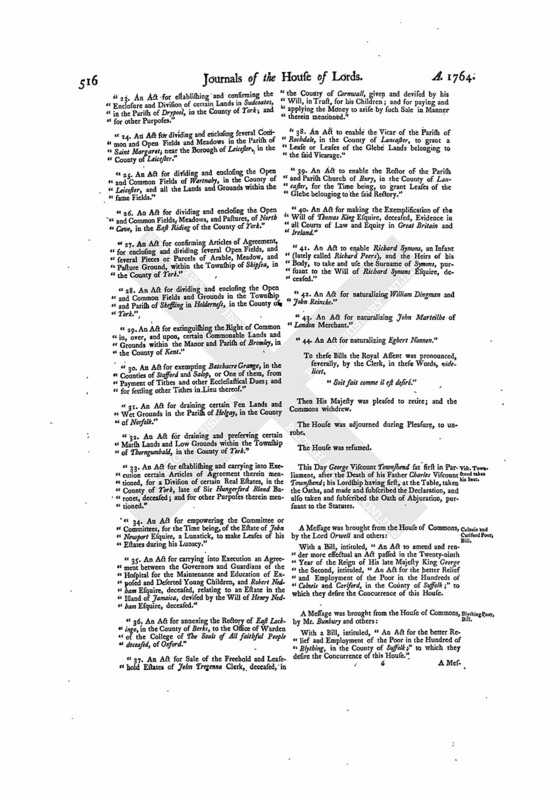 With a Bill, intituled, "An Act for continuing and enlarging the Term and Powers of an Act made in the Twenty-sixth Year of the Reign of His late Majesty, intituled, "An Act for repairing and widening the Road leading from Piper's Inn in the Parish of Ashcott in the County of Somerset, to and through Glastonbury and Wells, to the White Post in the Great Western Road to the City of Bath, and from Wells to Rush Hill, leading to the City of Bristol, and for repairing and widening several other Roads leading from the City of Wells;" to which they desire the Concurrence of this House. For regulating Buildings, and to prevent Mischiets by Fire, Bill. With a Bill, intituled, "An Act for the better regulating of Buildings, and to prevent Mischiess that may happen by Fire, within the Weekly Bills of Mortality, and other Places therein mentioned;" to which they desire the Concurrence of this House. With a Bill, intituled, "An Act for dividing and enclosing the Common Fields, Common Pastures, Common Meadows, Common Grounds, and Waste Grounds, of and in the Manor and Parish of Everdon, otherwise Great Everdon, and Little Everdon, in the County of Northampton;" to which they desire the Concurrence of this House. Kingston upon Hull, Streets, Bill. With a Bill, intituled, "An Act for amending and supplying the Deficiencies of an Act passed in the Second Year of the Reign of His present Majesty King George the Third, intituled, "An Act to amend and render more effectual several Acts made for cleansing and enlightening the Streets of the Town of Kingston upon Hull, and for preventing Annoyances therein;" to which they desire the Concurrence of this House. Hodie 1a vice lecta est Billa, intituled, "An Act for amending and widening the Road from the South End of the Town of Rotberham in the County of York to the present Turnpike Road near Pleasley in the County of Derby, and also the Road from the North End of the said Town of Rotherham into the present Turnpike Road on the East Side of Tankersley Park in the said County of York." The Lord Viscount Wentworth reported from the Lords Committees to whom the Bill, intituled, "An Act for dividing and enclosing the Common and Open Fields, and Commonable Places, of Sharnford, in the County of Leicester," was committed: "That they had considered the said Bill, and examined the Allegations thereof, which were found to be true; that the Parties concerned had given their Consents, to the Satisfaction of the Committee; and that the Committee had gone through the Bill, and directed him to report the same to the House, without any Amendment." The Lord Viscount Wentworth also made the like Report from the Lords Committees to whom the Bill, intituled, "An Act for dividing and enclosing the Open and Common Fields, Common Pastures, Common Meadows, and other Commonable Lands and Grounds, in Whetstone, in the County of Leicester," was committed. The Lord Sandys made the like Report from the Lords Committees to whom the Bill, intituled, "An Act for dividing and enclosing the Open and Common Fields, Common Meadows, Lammas Grounds, and other Commonable Lands and Grounds, in the Parish of Fotherby, in the County of Lincoln," was committed. Derby to Mansfield Roads, Bill. The Lord Sandys also reported from the Lords Committees to whom the Bill, intituled, "An Act for repairing and widening the Road from Derby to Mansfield in the County of Nottingham, and several other Roads therein mentioned," was committed: That they had considered the said Bill, and examined the Allegations thereof, which were found to be true; and that the Committee had gone through the Bill, and directed him to report the same to the House, without any Amendment." The Lord Sandys also made the like Report from the Lords Committees to whom the Bill, intituled, "An Act to enable John Pollard Esquire (lately called John Carter) and his Heirs Male to take and use the Surname and Arms of Pollard, pursuant to the Will of Elizabeth Pollard, deceased," was committed. The Lord Willoughby of Parham made the like Report from the Lords Committees to whom the Bill, intituled, An Act for continuing the Terms of, and amending, the Acts for repairing several Roads leading from Ledbury in the County of Hereford; and for widening and amending the Road through the Parish of Bromesberrow in the County of Gloucester, and through Corse Lawn, till it meets the Road from Gloucester to Worcester," was committed. The Lord Willoughby of Parham also made the like Report from the Lords Committees to whom the Bill, intituled, "An Act for naturalizing James Alric," was committed. The Lord Willoughby of Parham also made the like Report from the Lords Committees to whom the Bill, intituled, "An Act for naturalizing Peter Polhman," was committed. The Lord Delamer made the like Report from the Lords Committees to whom the Bill, intituled, "An Act for extending the Provisions of an Act passed in the Twenty-fifth Year of His late Majesty, for repairing the Roads from the North End of Malling Street near Lewes, and other Roads in Sussex, to the Road leading from the North End of Offham to The Spital Barn in Lewes aforesaid," was committed. Hodie 2a vice lecta est Billa, intituled, "An Act for enlarging the Term and Powers granted by an Act passed in the Twenty-fourth Year of the Reign of His late Majesty, intituled, "An Act for making, widening, and keeping in Repair, several Roads, in the several Parishes of Lambeth, Newington, Saint George Southwark, and Bermondesey, in the County of Surrey, and Lewisham in the County of Kent; and for repairing Lambeth Back Lane; and for lighting and watching the said Roads." L. B. Landaff. L. Le Despencer. Their Lordships, or any Five of them; to meet on Thursday next, at Ten o'Clock in the Forenoon, in the Prince's Lodgings near the House of Peers; and to adjourn as they please. Hodie 2a vice lecta est Billa, intituled, "An Act for establishing a regular and Nightly Watch, and for maintaining, regulating, and employing, the Poor, within the Parish of Saint Clement Danes, in the Liberty of Westminster and County of Middlesex." Ordered, That the Committee to whom the Bill, intituled, "An Act for amending and widening the Road from a Place near the Village of Milford, through Haslemere, to the Portsmouth Road between Lippock and Rake, in the several Counties of Surrey, Sussex, and Southampton," stands committed, be revived; and meet on Thursday next. 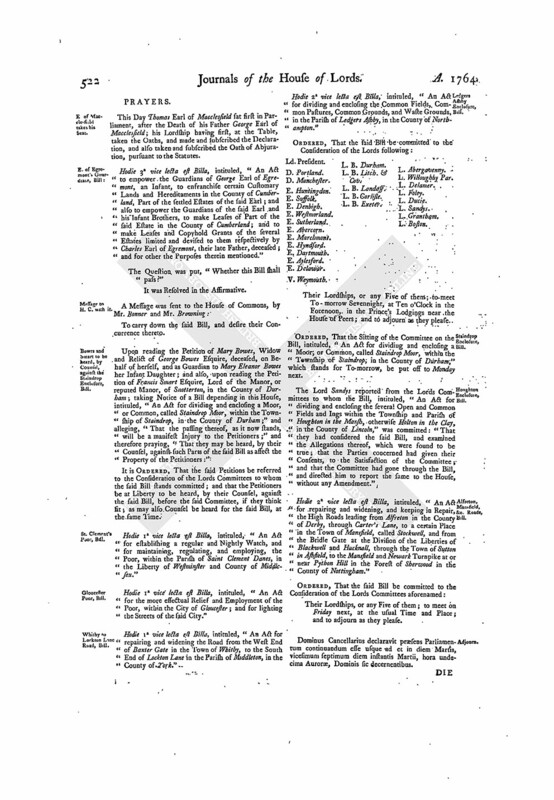 After reading, and considering, the Report of the Judges to whom was referred the Consideration of the Bill, intituled, "An Act for vesting Two Shares in Ranelagh House, Gardens, and Premises, late the Estate of James Delaune, deceased, in John Ferrett and Robert Edmeston, and their Heirs, in Trust, to sell the same, and apply the Money arising from such Sale to the several Charitable Purposes as directed by the Will of the said James Delaune." The Earl of Halifax acquainted the House, "That His Majesty, having been informed of the Purport of the said Bill," was pleased to consent (as far as His Majesty's Interest is concerned) that their Lordships may proceed therein as they shall think fit." Ordered, That the said Bill may be read a Second Time. The House (according to Order) was adjourned during Pleasure, and put into a Committee on the Bill, intituled, "An Act to dissolve the Marriage of John Weller Esquire with Charlotte Wilson his now Wife; and to enable him to marry again; and for other Purposes therein mentioned." Ordered, That the Cause which stands for Tomorrow be put off till To-morrow Sevennight; and that the other Causes on Cause-days be removed in Course. Mr. Berkeley's Clann of Peerage put off. Ordered, That the Sitting of the Committee of Privileges, upon the Petition of Norborne Berkeley Esquire to His Majesty, in relation to the Barony of Botetourt, which is appointed for To-morrow, be put off to Monday next. Dominus Cancellarius declaravit præsens Parliamentum continuandum esse usque ad & in diem Mercurii, vicesimum octavum diem instantis Martii, hora undecima Auroræ, Dominis sic decernentibus. Viscount Wentworth. Ds. Willoughby Par. An Appeal of Edward Farrell Esquire, was presented, and read; complaining of an Order of the Court of Chancery in Ireland, of the 27th Day of January 1764; and likewise of a Judgement, of the 5th Day of this Instant March. And it appearing to the House, "That the said Appeal was frivolous, and brought merely for Delay:"
Ordered, That the said Appeal be rejected. With a Bill, intituled, "An Act for repairing and widening the Road from Beverley to Kexby Bridge, in the County of York;" to which they desire the Concurrence of this House. Message from H. C. to return Brett's Bill. To return the Bill, intituled, "An Act for vesting divers Messuages and Hereditaments in the City of London, the settled Estate of Elizabeth Brett, Wife of Charles Brett Esquire, in the said Charles Brett and his Heirs, discharged from the Uses of his Marriage Settlement; and for settling another Estate, in the County of Middlesex, of greater Value, in Lieu thereof, to the Uses limited of the said settled Estate;" and to acquaint this House, that they have agreed to the same, without any Amendment. Hodie 3a vice lecta est Billa, intituled, "An Act for dividing and enclosing the several Open and Common Fields and Ings within the Township and Parish of Houghton in the Marsh, otherwise Holton in the Clay, in the County of Lincoln." Hodie 3a vice lecta est Billa, intituled, "An Act for dividing and enclosing the Common and Open Fields and Commonable Places of Sharnford, in the County of Leicester." Hodie 3a vice lecta est Billa, intituled, "An Act for dividing and enclosing the Open and Common Fields, Common Pastures, Common Meadows, and other Commonable Lands and Grounds, in Whetstone, in the County of Leicester." 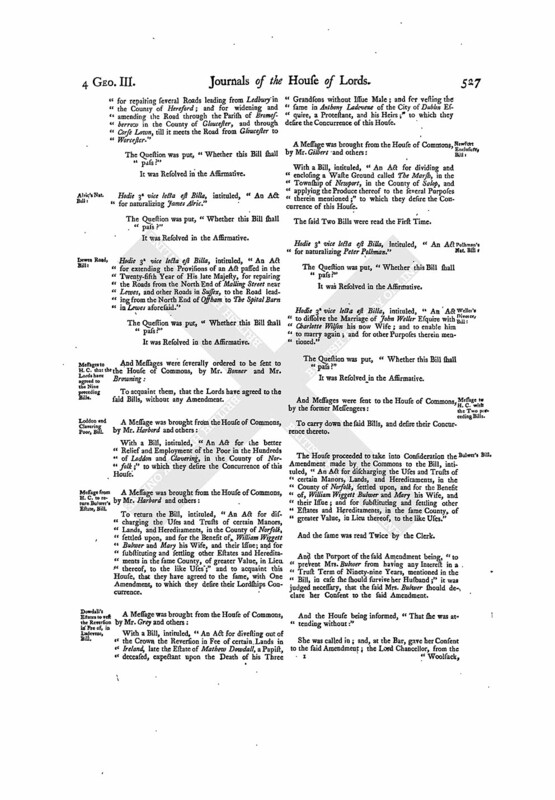 Hodie 3a vice lecta est Billa, intituled, "An Act for dividing and enclosing the Open and Common Fields, Common Meadows, Lammas Grounds, and other Commonable Lands and Grounds, in the Parish of Fotherby, in the County of Lincoln." Hodie 3a vice lecta est Billa, intituled, "An Act for repairing and widening the Road from Derby to Mansfield in the County of Nottingham, and several other Roads therein mentioned." Hodie 3a vice lecta est Billa, intituled, "An Act to enable John Pollard Esquire (lately called John Carter) and his Heirs Male to take and use the Surname and Arms of Pollard, pursuant to the Will of Elizabeth Pollard, deceased." Hodie 3a vice lecta est Billa, intituled, "An Act for continuing the Terms of, and amending, the Acts for repairing several Roads leading from Ledbury in the County of Hereford; and for widening and amending the Road through the Parish of Bromesberrow in the County of Gloucester, and through Corse Lawn, till it meets the Road from Gloucester to Worcester." Hodie 3a vice lecta est Billa, intituled, "An Act for naturalizing James Alric." Hodie 3a vice lecta est Billa, intituled, "An Act for extending the Provisions of an Act passed in the Twenty-fifth Year of His late Majesty, for repairing the Roads from the North End of Malling Street near Lewes, and other Roads in Sussex, to the Road leading from the North End of Offham to The Spital Barn in Lewes aforesaid." 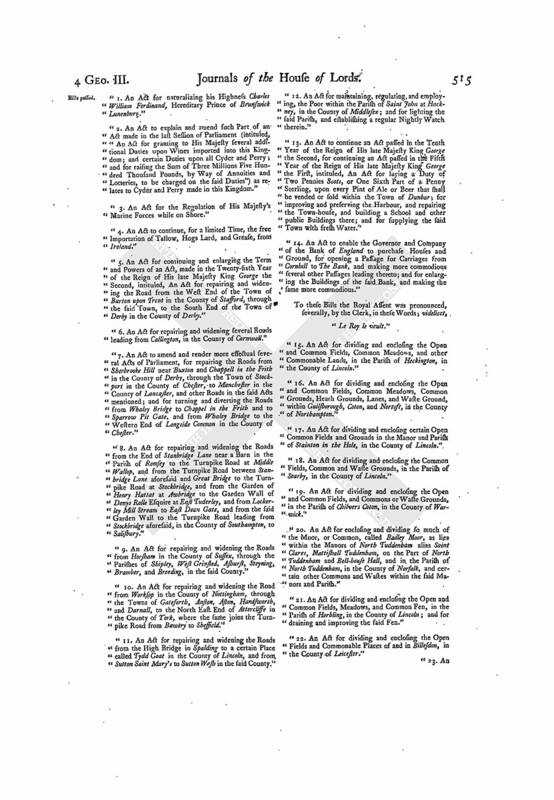 Messages to H. C. that the Lords have agreed to the Nine preceding Bills. Loddon and Clavering Poor, Bill. With a Bill, intituled, "An Act for the better Relief and Employment of the Poor in the Hundreds of London and Clavering, in the County of Norfolk;" to which they desire the Concurrence of this House. Message from H. C. to return Bulwer's Estate, Bill. To return the Bill, intituled, "An Act for discharging the Uses and Trusts of certain Manors, Lands, and Hereditaments, in the County of Norfolk, settled upon, and for the Benefit of, William Wiggett Bulwer and Mary his Wife, and their Issue; and for substituting and settling other Estates and Hereditaments in the same County, of greater Value, in Lieu thereof, to the like Uses;" and to acquaint this House, that they have agreed to the same, with One Amendment, to which they desire their Lordships Concurrence. Dowdali's Estates to vest the Reversion in Fee of, in Ladeveze, Bill. 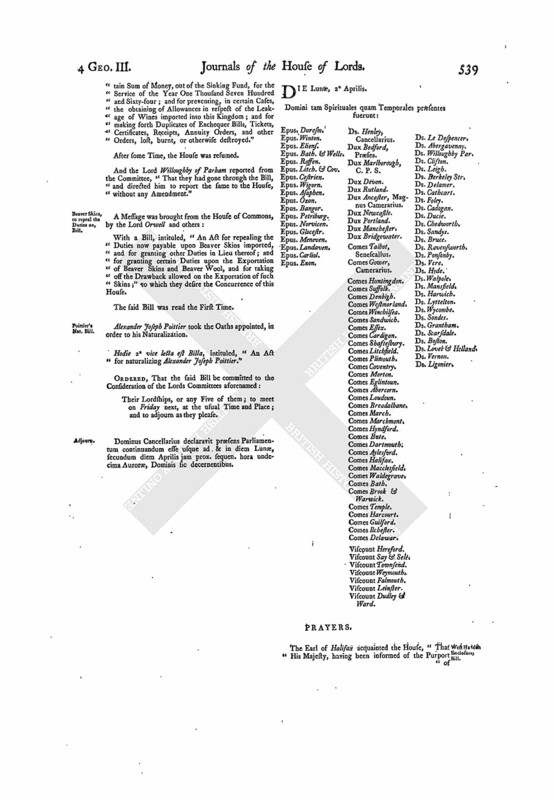 With a Bill, intituled, "An Act for divesting out of the Crown the Reversion in Fee of certain Lands in Ireland, late the Estate of Mathew Dowdall, a Papist, deceased, expectant upon the Death of his Three Grandsons without Issue Male; and for vesting the same in Anthony Ladeveze of the City of Dublin Esquire, a Protestant, and his Heirs;" to which they desire the Concurrence of this House. With a Bill, intituled, "An Act for dividing and enclosing a Waste Ground called The Marsh, in the Township of Newport, in the County of Salop, and applying the Produce thereof to the several Purposes therein mentioned;" to which they desire the Concurrence of this House. Hodie 3a vice lecta est Billa, intituled, "An Act for naturalizing Peter Polhman." Hodie 3a vice lecta est Billa, intituled, "An Act to dissolve the Marriage of John Weller Esquire with Charlotte Wilson his now Wife; and to enable him to marry again; and for other Purposes therein mentioned." 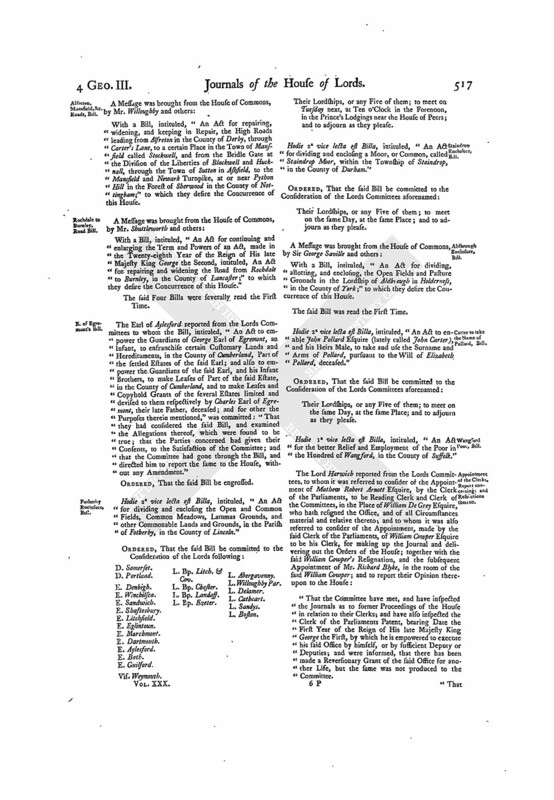 The House proceeded to take into Consideration the Amendment made by the Commons to the Bill, intituled, "An Act for discharging the Uses and Trusts of certain Manors, Lands, and Hereditaments, in the County of Norfolk, settled upon, and for the Benefit of, William Wiggett Bulwer and Mary his Wife, and their Issue; and for substituting and settling other Estates and Hereditaments, in the same County, of greater Value, in Lieu thereof, to the like Uses." And the same was read Twice by the Clerk. 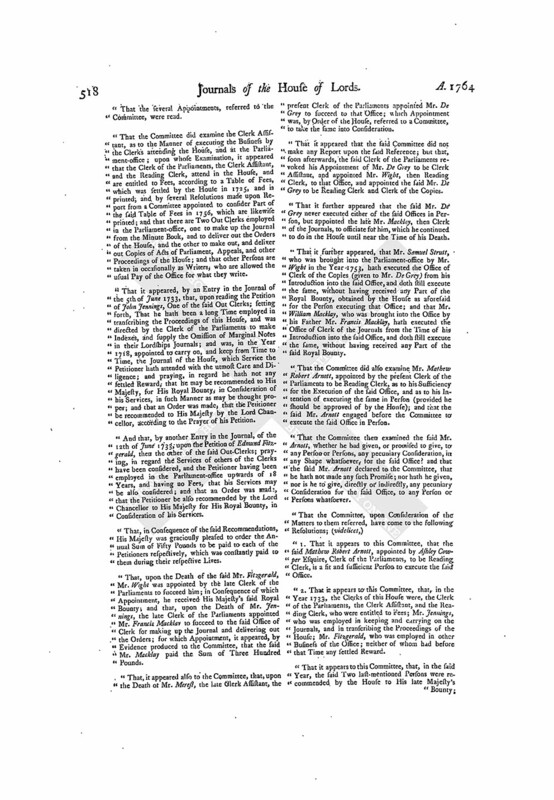 And the Purport of the said Amendment being, "to prevent Mrs. Bulwer from having any Interest in a Trust Term of Ninety-nine Years, mentioned in the Bill, in case she should survive her Husband;" it was judged necessary, that the said Mrs. Bulwer should declare her Consent to the said Amendment. And the House being informed, "That she was attending without:"
She was called in; and, at the Bar, gave her Consent to the said Amendment; the Lord Chancellor, from the Woolsack, having previously acquainted her with the Nature of the said Amendment. She was directed to withdraw. Then the said Amendment was read a Third Time, and agreed to. And a Message was sent to the House of Commons, by the former Messengers, to acquaint them therewith. Mercers Company, for Relief of the Creditors, Bill. With a Bill, intituled, "An Act for the Relief of the Bond and other Creditors of the Wardens and Commonalty of the Mystery of Mercers of the City of London;" to which they desire the Concurrence of this House. With a Bill, intituled, "An Act for the better Relief and Employment of the Poor in the Hundred of Bosmere and Claydon, in the County of Suffolk;" to which they desire the Concurrence of this House. The Lord Viscount Weymouth reported from the Lords Committees to whom the Bill, intituled, "An Act for settling the Estate of Henrietta Rosa Peregrina Townsend, Wife of James Townsend Esquire, according to certain Articles of Agreement, executed before her Intermarriage with the said James Townsend, but subject to the Charges and Encumbrances affecting the same," was committed: "That they had considered the said Bill, and examined the Allegations thereof, which were found to be true; that the Parties concerned had given their Consents, to the Satisfaction of the Committee; and that the Committee had gone through the Bill, and made several Amendments thereto." With a Bill, intituled, "An Act for granting to His Majesty a certain Sum of Money, out of the Sinking Fund, for the Service of the Year One Thousand Seven Hundred and Sixty-four; and for preventing, in certain Cases, the obtaining of Allowances in respect of the Leakage of Wines imported into this Kingdom; and for making forth Duplicates of Exchequer Bills, Tickets, Certificates, Receipts, Annuity Orders, and other Orders, lost, burnt, or otherwise destroyed;" to which they desire the Concurrence of this House. 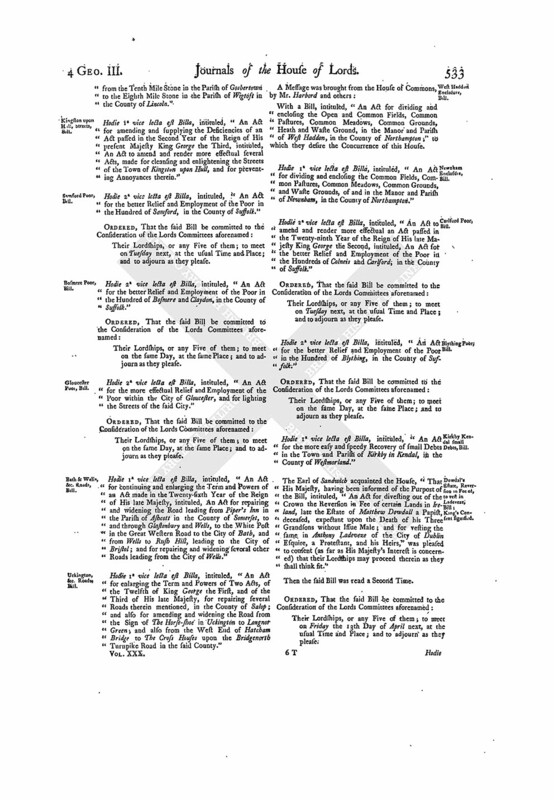 With a Bill, intituled, "An Act for continuing One Moiety of the Duties granted by an Act of the Eleventh and Twelfth Year of King William the Third, for the Repair of Dover Harbour; and which have been, by several other Acts, continued till the Twelfth Day of May One Thousand Seven Hundred and Sixty-five; and for applying the same to completing, and keeping in Repair the Harbour of Rye in the County of Sussex, and for more effectually compleating and keeping in Repair the said Harbour;" to which they desire the Concurrence of this House. The Lord Willoughby of Parham reported from the Lords Committees to whom the Bill, intituled, "An Act for dividing and enclosing the Open Fields and Commonable Places in the Parish of Stoney Stanton, in the County of Leicester, and the Lands, Meadows, and Commonable Places, in the Lordship of Potters Marston, in the said County, belonging to, and used with, the said Fields of Stoney Stanton," was committed: "That they had considered the said Bill, and examined the Allegations thereof, which were found to be true; that the Parties concerned had given their Consents, to the Satisfaction of the Committee; and that the Committee had gone through the Bill, and directed him to report the same to the House, without any Amendment." 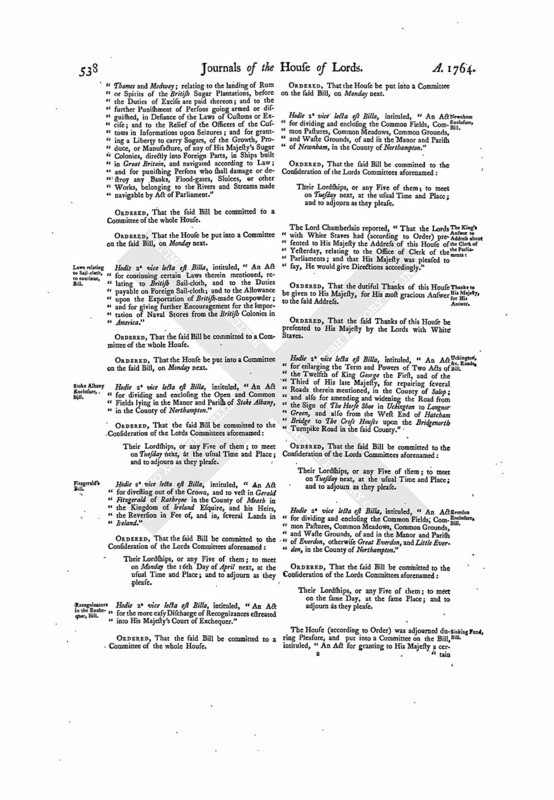 Aldbrough Enclosure, Bill: The King's Consent signified. The Earl of Sandwich acquainted the House, "That His Majesty, having been informed of the Purport of the Bill, intituled, "An Act for dividing, allotting, and enclosing, the Open Fields and Pasture Ground in the Lordship of Aldbrough, in Holderness, in the County of York," was pleased to consent (as far as His Majesty's Interest is concerned) that their Lordships may proceed therein as they shall think fit." The said Bill was read a Second Time. V. Weymouth. L. B. Sarum. L. B. Exeter. L. Willoughby Par. Their Lordships, or any Five of them; to meet on Friday next, at Ten o'Clock in the Forenoon, in the Prince's Lodgings near the House of Peers; and to adjourn as they please. Hodie 2a vice lecta est Billa, intituled, "An Act for amending and widening the Road from the South End of the Town of Rotherham in the County of York to the present Turnpike Road near Pleasley in the County of Derby; and also the Road from the North End of the said Town of Rotherham into the present Turnpike Road on the East Side of Tankersley Park in the said County of York." Hodie 2a vice lecta est Billa, intituled, "An Act for amending and widening the Road from Tinsley in the County of York to the Town of Doncaster in the said County." Kirby Kendall small Debts, Bill. With a Bill, intituled, "An Act for the more easy and speedy Recovery of small Debts in the Town and Parish of Kirkby in Kendal, in the County of Westmorland;" to which they desire the Concurrence of this House. With a Bill, intituled, "An Act to continue several Laws, for the better regulating of Pilots for the conducting of Ships and Vessels from Dover, Deal, and Isle of Thanet, up the Rivers of Thames and Medway; relating to the landing of Rum or Spirits of the British Sugar Plantations, before the Duties of Excise are paid thereon; and to the further Punishment of Persons going armed or disguised, in Defiance of the Laws of Customs or Excise, and to the Relief of the Officers of the Customs in Informations upon Seizures; and for granting a Liberty to carry Sugars of the Growth, Produce, or Manufacture of any of His Majesty's Sugar Colonies, directly into Foreign Parts, in Ships built in Great Britain, and navigated according to Law; and for punishing Persons who shall damage or destroy any Banks, Flood-gates, Sluices, or other Works, belonging to the Rivers and Streams made navigable by Act of Parliament;" to which they desire the Concurrence of this House. Laws relating to Sail Cloth, to continue, Bill. With a Bill, intituled, "An Act for continuing certain Laws therein mentioned, relating to British Sail Cloth, and to the Duties payable on Foreign Sail Cloth; and to the Allowance upon the Exportation of British made Gunpowder; and for giving further Encouragement for the Importation of Naval Stores from the British Colonies in America;" to which they desire the Concurrence of this House. Hodie 2a vice lecta est Billa, intituled, "An Act to continue the Term, and enlarge the Powers, of an Act passed in the Seventeenth Year of the Reign of His late Majesty, for repairing the Road between the Town of Kingston upon Hull and the Town of Beverley, in the East Riding of the County of York; and for repairing the Road from Newland Bridge to the West End of the Town of Cottingham, in the said Riding." Sutton, Ganstead, &c. Fens to drain; Bill. Hodie 2a vice lecta est Billa, intituled, "An Act for draining, preserving, and improving, the Low Grounds and Carrs lying and being in the Parishes, Townships, Hamlets, Lordships, Precincts, and Territories, of Sutton, Ganstead, Swine, Benningholme, Benningholme Grange, and Fairholme, North Skirlaugh, Rowton, Arnold, Long Riston, Leven, Heigholme, and Hallytree-Holme, Brandes-Burton, and Bursall, Eske, Tickton, Weel, Routh, Meaux, and Waghen otherwise Wawn, in Holderness, in the East Riding of the County of York." Hodie 2a vice lecta est Billa, intituled, "An Act for continuing and enlarging the Term and Powers of an Act made in the Twenty-eighth Year of the Reign of His late Majesty King George the Second, intituled, An Act for repairing and widening the Road from Rochdale to Burnley, in the County of Lancaster." Wigan supplying with Water, Bill. Hodie 1a vice lecta est Billa, intituled, "An Act for supplying the Borough and Town of Wigan, in the County of Lancaster, with fresh and wholesome Water." Hodie 2a vice lecta est Billa, intituled, "An Act for repairing and widening the Road from the West End of Baxter Gate in the Town of Whitby, to the South End of Lockton Lane in the Parish of Middleton, in the County of York." To regulate new Buildings, and prevent Mischiefs by Fire, Bill. Hodie 2a vice lecta est Billa, intituled, "An Act for the better regulating of Buildings, and to prevent Mischiefs that may happen by Fire, within the Weekly Bills of Mortality, and other Places therein mentioned." Ordered, That this House be put into a Committee on the said Bill, To-morrow. Upon reading the Petition of Henry Kock; praying, That Leave may be given to bring in a Bill, for his Naturalization:"
It is Ordered, That Leave be given to bring in a Bill, according to the Prayer of the said Petition. Accordingly, the Lord Willoughby of Parham presented to the House a Bill, intituled, "An Act for naturalizing Henry Kock." Upon reading the Petition of Alexander Joseph Poittier; praying, "That Leave may be given to bring in a Bill, for his Naturalization:"
Accordingly, the Earl of Marchmont presented to the House a Bill, intituled, "An Act for naturalizing Alexander Joseph Poittier." Dominus Cancellarius declaravit præsens Parliamentum continuandum esse usque ad & in diem Jovis, vicesimum nonum diem instantis Martii, hora undecima Auroræ, Dominis sic decernentibus. Viscount Falmouth. Ds. Le Despencer. The Answer of Beauchamp Bagenall Esquire, to the Appeal of Richard Chapell Whaley Esquire, was this Day brought in. The Lord Sandys reported from the Lords Committees to whom the Bill, intituled, "An Act for draining, preserving, and improving, the Low Grounds and Carrs lying and being in the Parishes, Townships, Hamlets, Lordships, Precincts, and Territories, of Sutton, Ganstead, Swine, Benningholme, Benningholme Grange, and Fairholme, North Skirlaugh, Rowton, Arnold, Long Riston, Leven, Heigholme, and Hallytree-Holme, Brandes-Burton, and Bursall, Eske, Tickton, Weel, Routh, Meaux, and Waghen otherwife Wawn, in Holdernesse, in the East Riding of the County of York," was committed: "That they had considered the said Bill, and examined the Allegations thereof, which were found to be true; that the Parties concerned had given their Consents, to the Satisfaction of the Committee; and that the Committee had gone through the Bill, and directed him to report the same to the House, without any Amendment." Delaune's Shares in Ranelagh, to vest in Trustees, Bill. 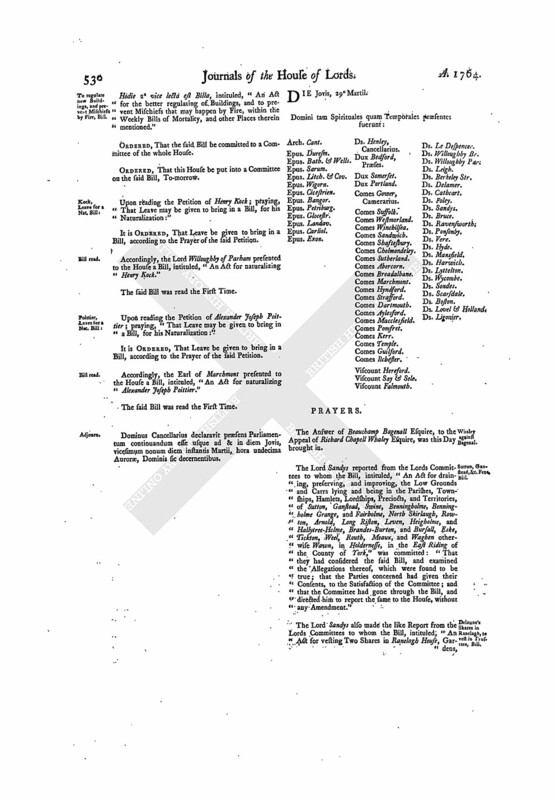 The Lord Sandys also made the like Report from the Lords Committees to whom the Bill, intituled, "An Act for vesting Two Shares in Ranelagh House, Gar dens, and Premises, late the Estate of James Delaune, deceased, in John Ferrett and Robert Edmeston, and their Heirs, in Trust, to sell the same, and apply the Money arising from such Sale to the several Charitable Purposes as directed by the Will of the said James Delaune," was committed. The Lord Sandys also reported from the Lords Committees to whom the Bill, intituled, "An Act for enlarging the Term and Powers granted by an Act passed in the Twenty-fourth Year of the Reign of His late Majesty, intituled, An Act for making, widening, and keeping in Repair, several Roads in the several Parishes of Lambeth, Newington, Saint George Southwark, and Bermondesey, in the County of Surrey, and Lewisham in the County of Kent, and for repairing Lambeth Back Lane, and for lighting and watching the said Roads," was committed: "That they had considered the said Bill, and examined the Allegations thereof, which were found to be true; and that the Committee had gone through the Bill, and directed him to report the same to the House, without any Amendment." The Lord Sandys also made the like Report from the Lords Committees to whom the Bill, intituled, "An Act for amending and widening the Road from a Place near the Village of Milford, through Haslemere, to the Portsmouth Road between Lippock and Rake, in the several Counties of Surrey, Sussex, and Southampton," was committed. The Lord Sandys also made the like Report from the Lords Committees to whom the Bill, intituled, "An Act for establishing a regular and Nightly Watch, and for maintaining, regulating, and employing, the Poor, within the Parish of Saint Clement Danes, in the Liberty of Westminster and County of Middlesex," was committed. Hodie 3a vice lecta est Billa, intituled, "An Act for dividing and enclosing the Open Fields and Commonable Places in the Parish of Stoney Stanton, in the County of Leicester, and the Lands, Meadows, and Commonable Places, in the Lordship of Potters Marston, in the said County, belonging to, and used with, the said Fields of Stoney Stanton." Hodie 3a vice lecta est Billa, intituled, "An Act for settling the Estate of Henrietta Rosa Peregrina Townsend, Wife of James Townsend Esquire, according to certain Articles of Agreement executed before her Intermarriage with the said James Townsend, but subject to the Charges and Encumbrances affecting the same." 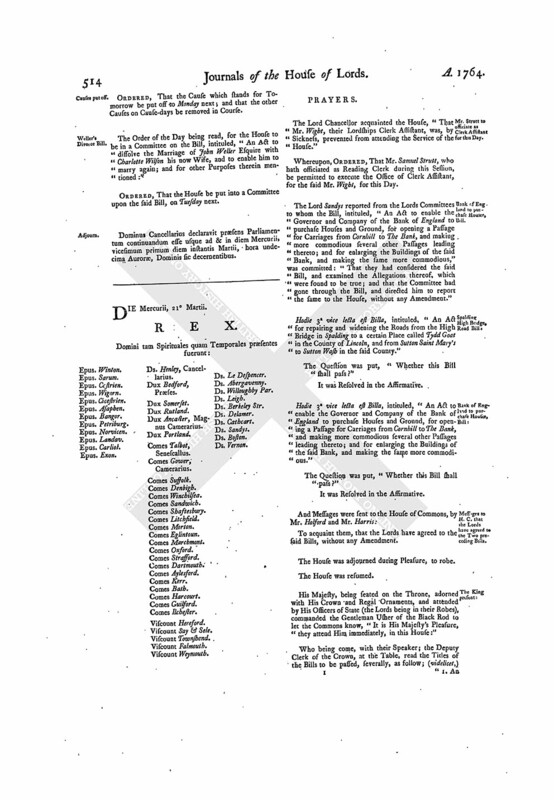 With a Bill, intituled, "An Act for explaining and amending an Act made in the Twenty-sixth Year of the Reign of His late Majesty King George the Second, intituled, An Act for amending, widening, and repairing, the Road leading from Dover to Barham Downs in the County of Kent; and also for amending, widening, and repairing, the Road from Cowgate and Archcliffe Fort in Dover, through Folkestone, to the Town of Hythe in the said County;" to which they desire the Concurrence of this House. With a Bill, intituled, "An Act for dividing and enclosing the Open and Common Fields lying in the Manor and Parish of Stoke Albany, in the County of Northampton;" to which they desire the Concurrence of this House. Message from H. C. relating to Abuses in Franking. "That a Message be sent to the Lords, to acquaint them, That this House, having taken into Consideration the great Scandal and Mischief arising from the excessive Increase of the Practice of counterfeiting the Hand, and fraudulently making Use of the Names, of Members of Parliament, in the Superscription of Letters and Packets, hath come to Resolutions, That, from the after the End of this present Session of Parliament, no Member of this House shall frank any Letter or Packet, unless the whole Superscription be of his own Hand-writing, or permit any Letter or Packet to be directed to him, at any Places besides those of his usual Residence, or where he shall actually be at the Time, or at the Lobby of this House; with an Exception only to such printed Votes and Proceedings in Parliament, or printed News-papers, as shall be sent without Covers, or in Covers open at the Sides." The Messengers were called in again, and told, "That the Lords will send an Answer, by Messengers of their own." Recognizances in the Exchequer, Bill. Hodie 1a vice lecta est Billa, intituled, "An Act for the more easy discharge of Recognizances estreated into His Majesty's Court of Exchequer." 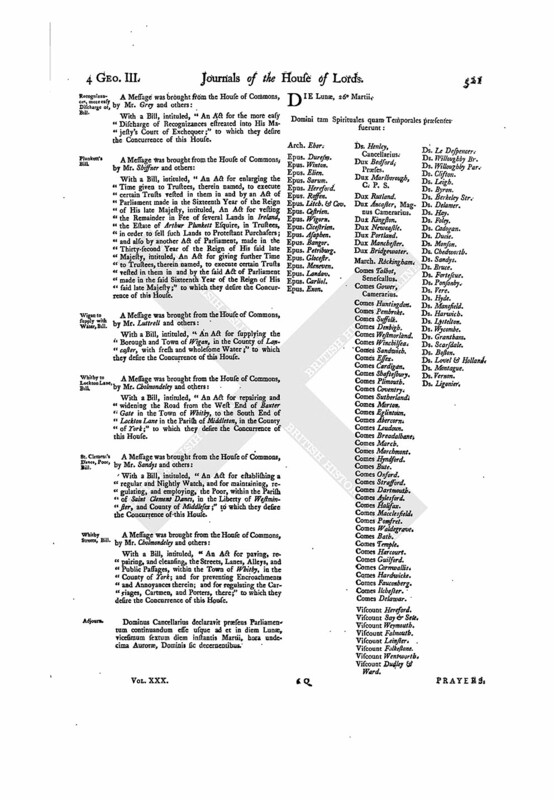 Ordered, That all the Lords who have been present this Session, and not named of the Committee to whom the Bill, intituled, "An Act for dividing and enclosing a Moor, or Common, called Staindrop Moor, within the Township of Staindrop, in the County of Durham," stands committed, be added to the said Committee. Hodie 1a vice lecta est Billa, intituled, "An Act for dividing and enclosing the Open and Common Fields of Atherstone, in the County of Warwick, and all the Lands, Meadows, and Grounds, within the same." Hodie 2a vice lecta est Billa, intituled, "An Act for granting to His Majesty a certain Sum of Money, out of the Sinking Fund, for the Service of the Year One Thousand Seven Hundred and Sixty-four; and for preventing, in certain Cases, the obtaining of Allowances, in respect of the Leakage of Wines imported into this Kingdom; and for making forth Duplicates of Exchequer Bills, Tickets, Certificates, Receipts, Annuity Orders, and other Orders, lost, burnt, or otherwise destroyed." Ordered, That the House be put into a Committee on the said Bill, To-morrow. Mercers Company, for Relief of the Creditors of, Bill. Hodie 1a vice lecta est Billa, intituled, "An Act for the Relief of the Bond and other Creditors of the Wardens and Commonalty of the Mystery of Mercers of the City of London." Hodie 1a vice lecta est Billa, intituled, "An Act to continue several Laws, for the better regulating of Pilots for the conducting of Ships and Vessels from Dover, Deal, and Isle of Thanet, up the Rivers of Thames and Medway; relating to the Landing of Rum or Spirits of the British Sugar Plantations before the Duties of Excise are paid thereon; and to the further Punishment of Persons going armed or disguised, in Defiance of the Laws of Customs or Excise, and to the Relief of the Officers of the Customs in Informations upon Seizures; and for granting a Liberty to carry Sugars, of the Growth, Produce, or Manufacture of any of His Majesty's Sugar Colonies, directly into Foreign Parts, in Ships built in Great Britain, and navigated according to Law; and for punishing Persons who shall damage or destroy any Banks, Flood-gates, Sluices, or other Works, belonging to the Rivers and Streams made navigable by Act of Parliament." Laws relating to Sail-cloth, to continue, Bill. Hodie 1a vice lecta est Billa, intituled, "An Act for continuing certain Laws therein mentioned, relating to British Sail-cloth, and to the Duties payable on Foreign Sail-cloth; and to the Allowance upon the Exportation of British-made Gunpowder; and for giving further Encouragement for the Importation of Naval Stores from the British Colonies in America." Hodie 2a vice lecta est Billa, intituled, "An Act for supplying the Borough and Town of Wigan in the County of Lancaster with fresh and wholesome Water." V. Say & Sele. L. B. Sarum. L. B. Landaff. L. Willoughby Par. Hodie 1a vice lecta est Billa, intituled, "An Act for paving, repairing, and cleansing the Streets, Lanes, Alleys, and publick Passages within the Town of Whitby in the County of York, and for preventing Encroachments and Annoyances therein; and for regulating the Carriages, Cartmen, and Porters there." Kent to sell Bayly's Estate, Bill. Hodie 2a vice lecta est Billa, intituled, "An Act for vesting certain Messuages, Lands, Tenements, and Hereditaments, in the Town and County of Northampton, devised by the Will of Edward Bayly deceased, in Trustees, to be sold; and for laying out the Money arising by such Sale in the Purchase of other Lands, to be settled to the like Uses." Their Lordships, or any Five of them; to meet on Friday the 13th Day of April next, at the usual Time and Place; and to adjourn as they please. Hodie 1a vice lecta est Billa, intituled, "An Act for dividing and enclosing a certain Moor, or Common, in the Township of Crook and Billyrow, within the Parish of Brancepeth, in the County of Durham." Hodie 1a vice lecta est Billa, intituled, "An Act for dividing and enclosing the Common Fields, Common Pastures, Common Meadows, Common Grounds, and Waste Grounds, of and in the Manor and Parish of Everdon, otherwise Great Everdon, and Little Everdon, in the County of Northampton." Spalding to Donington Road, Bill. Hodie 1a vice lecta est Billa, intituled, "An Act for repairing and widening the Roads from Spalding High Bridge to the Market-place in Donington, and from the Tenth Mile Stone in the Parish of Gosbertown to the Eighth Mile Stone in the Parish of Wigtoft in the County of Lincoln." Hodie 1a vice lecta est Billa, intituled, "An Act for amending and supplying the Deficiencies of an Act passed in the Second Year of the Reign of His present Majesty King George the Third, intituled, An Act to amend and render more effectual several Acts, made for cleansing and enlightening the Streets of the Town of Kingston upon Hull, and for preventing Annoyances therein." Hodie 2a vice lecta est Billa, intituled, "An Act for the better Relief and Employment of the Poor in the Hundred of Samford, in the County of Suffolk." Their Lordships, or any Five of them; to meet on Tuesday next, at the usual Time and Place; and to adjourn as they please. Hodie 2a vice lecta est Billa, intituled, "An Act for the better Relief and Employment of the Poor in the Hundred of Bosmere and Claydon, in the County of Suffolk." Hodie 2a vice lecta est Billa, intituled, "An Act for the more effectual Relief and Employment of the Poor within the City of Gloucester, and for lighting the Streets of the said City." Bath & Wells, &c. Roads, Bill. Hodie 1a vice lecta est Billa, intituled, "An Act for continuing and enlarging the Term and Powers of an Act made in the Twenty-sixth Year of the Reign of His late Majesty, intituled, An Act for repairing and widening the Road leading from Piper's Inn in the Parish of Ashcott in the County of Somerset, to and through Glastonbury and Wells, to the White Post in the Great Western Road to the City of Bath, and from Wells to Rush Hill, leading to the City of Bristol; and for repairing and widening several other Roads leading from the City of Wells." Hodie 1a vice lecta est Billa, intituled, "An Act for enlarging the Term and Powers of Two Acts, of the Twelfth of King George the First, and of the Third of His late Majesty, for repairing several Roads therein mentioned, in the County of Salop; and also for amending and widening the Road from the Sign of The Horse-shoe in Uckington to Longnor Green; and also from the West End of Hatcham Bridge to The Cross House upon the Bridgenorth Turnpike Road in the said County." With a Bill, intituled, "An Act for dividing and enclosing the Open and Common Fields, Common Pastures, Common Meadows, Common Grounds, Heath and Waste Ground, in the Manor and Parish of West Haddon, in the County of Northampton;" to which they desire the Concurrence of this House. Hodie 1a vice lecta est Billa, intituled, "An Act for dividing and enclosing the Common Fields, Common Pastures, Common Meadows, Common Grounds, and Waste Grounds, of and in the Manor and Parish of Newnham, in the County of Northampton." Hodie 2a vice lecta est Billa, intituled, "An Act to amend and render more effectual an Act passed in the Twenty-ninth Year of the Reign of His late Majesty King George the Second, intituled, An Act for the better Relief and Employment of the Poor in the Hundreds of Colneis and Carlford, in the County of Suffolk." Hodie 2a vice lecta est Billa, intituled, "An Act for the better Relief and Employment of the Poor in the Hundred of Blything, in the County of Suffolk." Kirkby Kendal small Debts, Bill. Hodie 1a vice lecta est Billa, intituled, "An Act for the more easy and speedy Recovery of small Debts in the Town and Parish of Kirkby in Kendal, in the County of Westmorland." Dowdal's Estate, Reversion in Fee of, to vest in Ladeveze, Bill; King's Consent signified. The Earl of Sandwich acquainted the House, "That His Majesty, having been informed of the Purport of the Bill, intituled, "An Act for divesting out of the Crown the Reversion in Fee of certain Lands in Ireland, late the Estate of Matthew Dowdall a Papist, deceased, expectant upon the Death of his Three Grandsons without Issue Male; and for vesting the same in Anthony Ladeveze of the City of Dublin Esquire, a Protestant, and his Heirs," was pleased to consent (as far as His Majesty's Interest is concerned) that their Lordships may proceed therein as they shall think fit." Hodie 2a vice lecta est Billa, intituled, "An Act for continuing One Moiety of the Duties granted by an Act of the Eleventh and Twelfth Year of King William the Third for the Repair of Dover Harbour; and which have been, by several other Acts, continued till the Twelfth Day of May One Thousand Seven Hundred and Sixty-five; and for applying the same to compleating and keeping in Repair the Harbour of Rye, in the County of Sussex; and for more effectually compleating and keeping in Repair the said Harbour." Hodie 1a vice lecta est Billa, intituled, "An Act for repairing and widening the Road from Beverley to Kexby Bridge, in the County of York." Address to His Majesty, not to grant any more Reversions of the Office of Clerk of the Parliaments. Ordered, That an humble Address be presented to His Majesty, "To desire that He will be graciously pleased to direct, that no Reversion be hereafter granted of the Office of Clerk of the Parliaments; and that, when the said Office shall become vacant, it be granted, for the future, not otherwise than so that such Clerk may be removeable from the said Office, upon the Address of this House to the Crown." Hodie 1a vice lecta est Billa, intituled, "An Act for dividing and enclosing the Open and Common Fields in the Parish of Great Wigston, in the County of Leicester." Henry Kock took the Oaths appointed, in order to his Naturalization. Hodie 2a vice lecta est Billa, intituled, "An Act for naturalizing Henry Kock." The Order of the Day, for taking into Consideration the Matter of the Complaint, "That the Names of several Lords of this House had been counterfeited, in the Franking of Letters to be sent by the General Post, in order to prevent their being charged with the Duty of Postage," was read. And several Lords, in their Places, declaring, "That their Names had been counterfeited; as also the Names of several other Lords not present, particularly the Name of the Lord Dacre, which," the Lord Bishop of Litchfield and Coventry acquainted the House, "had been counterfeited in the Franking of Two-and-forty Dozen of Covers for Letters:"
And it being moved, "That the Message relating to Franks, this Day brought up from the House of Commons, might be read:"
The same was accordingly read, by the Clerk. Resolved, Nemine Contradicente, by the Lords Spiritual and Temporal in Parliament assembled, That it appears to this House, that the Practice of counterfeiting the Hands of Members of this House upon Letters, in order to prevent their being charged with the Duty of Postage, is become extremely frequent and notorious. Resolved, Nemine Contradicente, by the Lords Spiritual and Temporal in Parliament assembled, That, from and after the End of this present Session of Parliament, no Member of this House do frank any Letter or Packet, except such printed Votes and Proceedings in Parliament, or printed News Papers, as shall be sent without Covers, or in Covers open at the Sides, unless the whole Superscription be of his own Hand-writing. Resolved, Nemine Contradicente, by the Lords Spiritual and Temporal in Parliament assembled, That, from and after the End of this present Session of Parliament, no Member of this House do authorize or permit any Letters or Packets, other than such printed Votes and Proceedings in Parliament, or printed News-papers, as shall be sent without Covers, or in Covers open at the Sides, to be directed to him at any Places besides those of his usual Residence, or where he shall actually be at the Time of delivering such Letters or Packets. Message to H. C. wish them. And a Message was ordered to be sent to the House of Commons, by Mr. Bonner and Mr. Browning, to acquaint them, "That the Lords have taken the Subjectmatter of their Message into Consideration; and have come to the said several Resolutions abovementioned." The House (according to Order) was adjourned during Pleasure, and put into a Committee on the Bill, intituled, "An Act for the better regulating of Buildings, and to prevent Mischiefs that may happen by Fire, within the Weekly Bills of Mortality, and other Places therein mentioned." 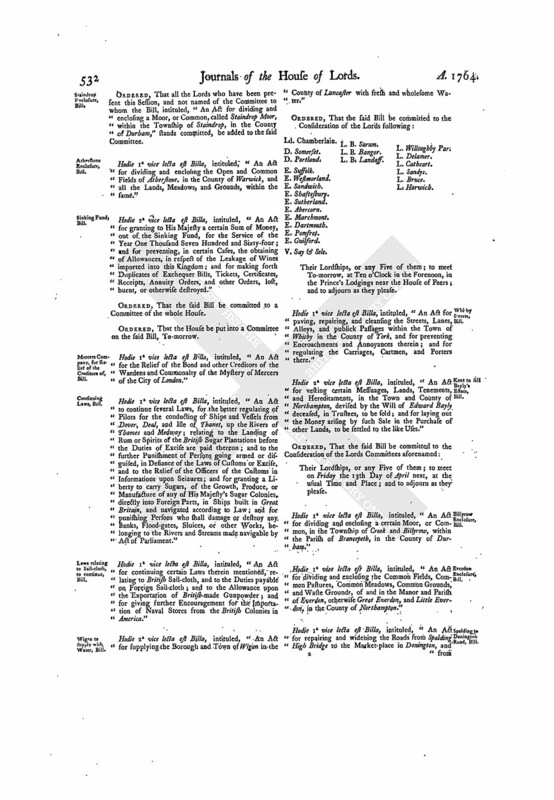 With a Bill, intituled, "An Act for divesting out of the Crown, and to vest in Gerald Fitz Gerald of Rathrone in the County of Meath in the Kingdom of Ireland Esquire, and his Heirs, the Reversion in Fee of and in several Lands in Ireland;" to which they desire the Concurrence of this House. The Earl of Sandwich acquainted the House, "That His Majesty, having been informed of the Purport of the said Bill, was pleased to consent (as far as His Majesty's Interest is concerned) that their Lordships may proceed therein as they shall think fit." With a Bill, intituled, "An Act to enlarge the Term and Powers of so much of an Act of the Twenty-ninth Year of the Reign of His late Majesty, for repairing and widening several Roads therein described, leading from the Town of Tewkesbury in the County of Gloucester, as relates to the First District of Roads therein mentioned; and for amending the Road from Comb Hill to a Bridge near Norton Mill in the County of Gloucester, and from Eckington Bridge to join the Turnpike Road which leads from Upton on severn to Pershore in the County of Worcester;" to which they desire the Concurrence of this House. Hodie 1a vice lecta est Billa, intituled, "An Act for enlarging the Time given to Trustees therein named to execute certain Trusts vested in them in and by an Act of Parliament made in the Sixteenth Year of the Reign of His late Majesty, intituled, An Act for vesting the Remainder in Fee of several Lands in Ireland, the Estate of Arthur Plunkett Esquire, in Trustees, in order to sell such Lands to Protestant Purchasers; and also by another Act of Parliament, made in the Thirty-second Year of the Reign of His said late Majesty, intituled, An Act for giving further Time to Trustees therein named, to execute certain Trusts vested in them in and by the said Act of Parliament, made in the said Sixteenth Year of the Reign of His said late Majesty." Hodie 1a vice lecta est Billa, intituled, "An Act for dividing and enclosing the Open and Common Fields, Common Pastures, Common Meadows, Common Grounds, Heath, and Waste Ground, in the Manor and Parish of West Haddon, in the County of Northampton." Dominus Cancellarius declaravit præsens Parliamentum continuandum esse usque ad et in diem Veneris, tricesimum diem instantis Martii, hora undecima Auroræ, Dominis sic decernentibus. Viscount Dudley & Ward. Ds. Willoughby Par. Tinsley to Doncaster Road, Bill. The Earl of Winchilsea reported from the Lords Committees to whom the Bill, intituled, "An Act for amending and widening the Road from Tinsley in the County of York, to the Town of Doncaster in the said County," was committed: "That they had considered the said Bill, and examined the Allegations thereof, which were found to be true; and that the Committee had gone through the Bill, and directed him to report the same to the House, without any Amendment." The Earl of Winchilsea also made the like Report from the Lords Committees to whom the Bill, intituled, "An Act for amending and widening the Road from the South End of the Town of Rotherham in the County of York, to the present Turnpike Road near Pleasley in the County of Derby, and also the Road from the North End of the said Town of Rotherham into the present Turnpike Road on the East Side of Tankersley Park in the said County of York," was committed. The Earl of Winchilsea also made the like Report from the Lords Committees to whom the Bill, intituled, "An Act to continue the Term, and enlarge the Powers, of an Act passed in the Seventeenth Year of the Reign of His late Majesty, for repairing the Road between the Town of Kingston upon Hull and the Town of Beverley in the East Riding of the County of York, and for repairing the Road from Newland Bridge to the West End of the Town of Cottingham in the said Riding," was committed. The Earl of Marchmont made the like Report from the Lords Committees to whom the Bill, intituled, "An Act for continuing One Moiety of the Duties granted by an Act of the Eleventh and Twelfth Year of King William the Third, for the Repair of Dover Harbour; and which have been, by several other Acts, continued till the Twelfth Day of May One Thousand Seven Hundred and Sixty-five; and for applying the same to compleating and keeping in Repair the Harbour of Rye in the County of Sussex, and for more effectually compleating and keeping in Repair the said Harbour," was committed. 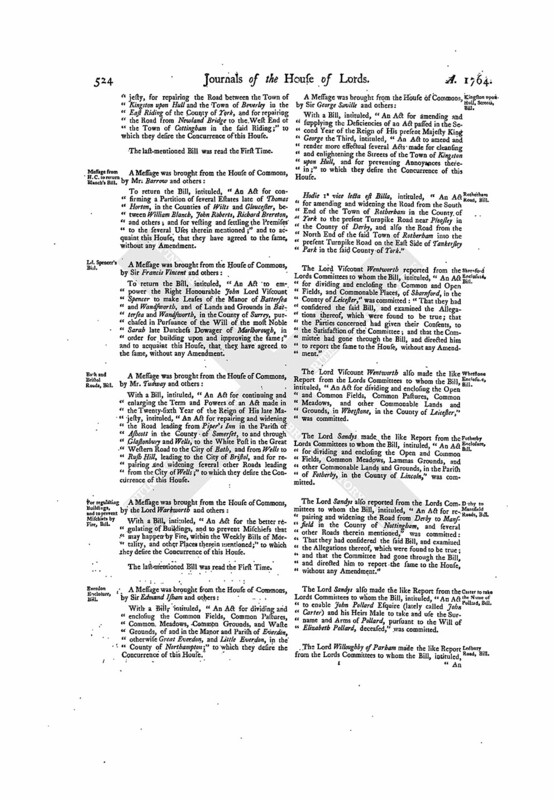 The Lord Willoughby of Parham made the like Report from the Lords Committees to whom the Bill, intituled, An Act for continuing and enlarging the Term and Powers of an Act made in the Twenty-eighth Year of the Reign of His late Majesty King George the Second, intituled, An Act for repairing and widening the Road from Rochdale to Burnley in the County of Lancaster," was committed. Wigan to supply with fresh Water, Bill. The Lord Willoughby of Parham also made the like Report from the Lords Committees to whom the Bill, intituled, "An Act for supplying the Borough and Town of Wigan in the County of Lancaster with fresh and wholsome Water," was committed. The Lord Willoughby of Parham also made the like Report from the Lords Committees to whom the Bill, intituled, "An Act for repairing, widening, and keeping in Repair, the High Roads leading from Alfreton in the County of Derby, through Carter's Lane, to a certain Place in the Town of Mansfield, called Stockwell, and from the Bridle Gate at the Division of the Liberties of Blackwell and Hucknall, through the Town of Sutton in Ashfield, to the Mansfield and Newark Turnpike, at or near Python Hill in the Forest of Sherwood in the County of Nottingham," was committed. The Lord Willoughby of Parham also made the like Report from the Lords Committees to whom the Bill, intituled, "An Act for naturalizing Henry Kock," was committed. The Lord Willoughby of Parham also reported from the Lords Committees to whom the Bill, intituled, "An Act for dividing, allotting, and enclosing, the Open Fields and Pasture Ground in the Lordship of Aldbrough in Holderness, in the County of York," was committed: "That they had considered the said Bill, and examined the Allegations thereof, which were found to be true; that the Parties concerned had given their Consents, to the Satisfaction of the Committee; and that the Committee had gone through the Bill, and directed him to report the same to the House, without any Amendment." Watling Street to Beckbury, &c. Roads, Bill. With a Bill, intituled, "An Act for amending, widening, and keeping in Repair, several Roads, leading from The Buck's Head at Watling Street to Beckbury and The New Inn, and from The Birches Brook to the Hand Post in the Parish of Kemberton, in the County of Salop;" to which they desire the Concurrence of this House. 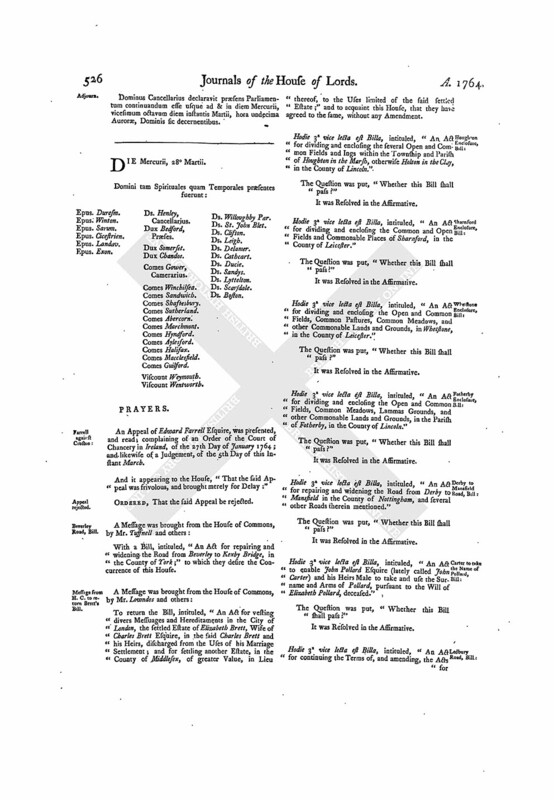 With a Bill, intituled, "An Act to enable Lucy Knightley Esquire to enclose several Open and Common Fields in the Parish of Haversham, in the County of Bucks; and for vesting certain Glebe Lands and Tithes, belonging to the Rectory of Haversham aforesaid, in the said Lucy Knightley and his Heirs; and for making a Compensation to the Rector of the said Parish, in Lieu thereof;" to which they desire the Concurrence of this House. Delaune's Shares in Ranelagh to vest in Trustees, Bill. Hodie 3a vice lecta est Billa, intituled, "An Act for vesting Two Shares in Ranelagh House, Gardens, and Premises, late the Estate of James Delaune, deceased, in John Ferrett and Robert Edmeston, and their Heirs, in Trust, to sell the same, and apply the Money arising from such Sale to the several Charitable Purposes as directed by the Will of the said James Delaune." Hodie 3a vice lecta est Billa, intituled, "An Act for establishing a regular and nightly Watch, and for maintaining, regulating, and employing, the Poor, within the Parish of Saint Clement Danes, in the Liberty of Westminster and County of Middlesex." Hodie 3a vice lecta est Billa, intituled, "An Act for the better regulating of Buildings, and to prevent Mischiefs that may happen by Fire, within the Weekly Bills of Mortality, and other Places therein mentioned." Hodie 3a vice lecta est Billa, intituled, "An Act for enlarging the Term and Powers granted by an Act passed in the Twenty-fourth Year of the Reign of His late Majesty, intituled, An Act for making, widening, and keeping in Repair, several Roads, in the several Parishes of Lambeth, Newington, Saint George Southwark, and Bermondsey, in the County of Surrey, and Lewisham in the County of Kent, and for repairing Lambeth Back Lane; and for lighting and watching the said Roads." Hodie 3a vice lecta est Billa, intituled, "An Act for amending and widening the Road from a Place near the Village of Milford, through Haslcmere, to the Portsmouth Road between Lippock and Rake, in the several Counties of Surrey, Sussex, and Southampton." Hodie 3a vice lecta est Billa, intituled, "An Act for draining, preserving, and improving, the Low Grounds and Carrs lying and being in the Parishes, Townships, Hamlets, Lordships, Precincts, and Territories, of Sutton, Ganstead, Swine, Benningholme, Benningholme Grange, and Fairholme, North Skirlaugh, Rowton, Arnold, Long Riston, Leven, Heigholme and Hallytree-Holme, Brandes-Burton, and Bursall, Eske, Tickton, Weel, Rowth, Meaux, and Waghen otherwife Wawn, in Holderness, in the East Riding of the County of York." 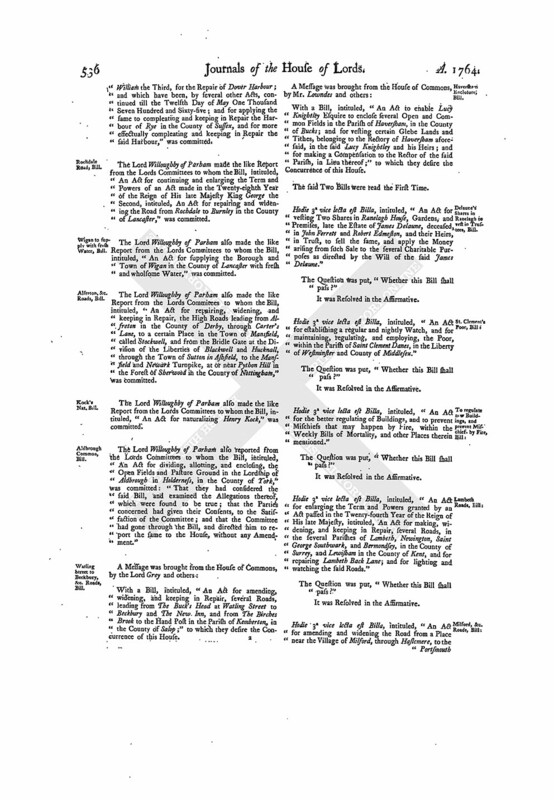 Messages to H. C. that the Lords have agreed to the Six preceding Bills. Hodie 2a vice lecta est Billa, intituled, "An Act for dividing and enclosing the Open and Common Fields of Atherstone, in the County of Warwick, and all the Lands, Meadows, and Grounds, within the same." V. Say & Sele. L. B. Durham. Hodie 2a vice lecta est Billa, intituled, "An Act for the Relief of the Bond and other Creditors of the Wardens and Commonalty of the Mystery of Mercers of the City of London." Hodie 2a vice lecta est Billa, intituled; "An Act for amending, and supplying the Deficiencies of, an Act passed in the Second Year of the Reign of His present Majesty King George the Third, intituled, An Act to amend, and render more effectual, several Acts, made for cleansing and enlightening the Streets of the Town of Kingston upon Hull; and for preventing Annoyances therein:"
Kirkby Kendall small Debts, Bill. Hodie 2a vice lecta est Billa, intituled, "An Act for the more easy and speedy Recovery of small Debts in the Town and Parish of Kirkby in Kendal, in the County of Westmorland." Beverley to Kexby, Road, Bill. Hodie 2a vice lecta est Billa, intituled, "An Act for repairing and widening the Road from Beverley to Kexby Bridge, in the County of York." Hodie 2a vice lecta est Billa, intituled, "An Act for paving, repairing, and cleansing, the Streets, Lanes, Alleys, and publick Passages, within the Town of Whitby, in the County of York; and for preventing Encroachments and Annoyances therein; and for regulating the Carriages, Cartmen, and Porters, there." Hodie 2a vice lecta est Billa, intituled, "An Act for dividing and enclosing a certain Moor, or Common, in the Township of Crook and Billyrow, within the Parish of Brancepeth, in the County of Durham:"
Hodie 2a vice lecta est Billa, intituled, "An Act to continue several Laws, for the better regulating of Pilots for the conducting of Ships and Vessels from Dover, Deal, and Isle of Thanet, up the Rivers of Thames and Medway; relating to the landing of Rum or Spirits of the British Sugar Plantations, before the Duties of Excise are paid thereon; and to the further Punishment of Persons going armed or disguished, in Defiance of the Laws of Customs or Excise; and to the Relief of the Officers of the Customs in Informations upon Seizures; and for granting a Liberty to carry Sugars, of the Growth, Produce, or Manufacture, of any of His Majesty's Sugar Colonies, directly into Foreign Parts, in Ships built in Great Britain, and navigated according to Law; and for punishing Persons who shall damage or destroy any Banks, Flood-gates, Sluices, or other Works, belonging to the Rivers and Streams made navigable by Act of Parliament." Ordered, That the House be put into a Committee on the said Bill, on Monday next. Hodie 2a vice lecta est Billa, intituled, "An Act for continuing certain Laws therein mentioned, relating to British Sail-cloth, and to the Duties payable on Foreign Sail-cloth; and to the Allowance upon the Exportation of British-made Gunpowder; and for giving further Encouragement for the Importation of Naval Stores from the British Colonies in America." Hodie 2a vice lecta est Billa, intituled, "An Act for dividing and enclosing the Open and Common Fields lying in the Manor and Parish of Stoke Albany, in the County of Northampton." Hodie 2a vice lecta est Billa, intituled, "An Act for divesting out of the Crown, and to vest in Gerald Fitzgerald of Rathrone in the County of Meath in the Kingdom of Ireland Esquire, and his Heirs, the Reversion in Fee of, and in, several Lands in Ireland." Their Lordships, or any Five of them; to meet on Monday the 16th Day of April next, at the usual Time and Place; and to adjourn as they please. Hodie 2a vice lecta est Billa, intituled, "An Act for the more easy Discharge of Recognizances estreated into His Majesty's Court of Exchequer." Hodie 2a vice lecta est Billa, intituled, "An Act for dividing and enclosing the Common Fields, Common Pastures, Common Meadows, Common Grounds, and Waste Grounds, of and in the Manor and Parish of Newnham, in the County of Northampton." The Lord Chamberlain reported, "That the Lords with White Staves had (according to Order) presented to His Majesty the Address of this House of Yesterday, relating to the Office of Clerk of the Parliaments; and that His Majesty was pleased to say, He would give Directions accordingly." Thanks to His Majesty, for His Answer. Ordered, That the dutiful Thanks of this House be given to His Majesty, for His most gracious Answer to the said Address. Ordered, That the said Thanks of this House be presented to His Majesty by the Lords with White Staves. Hodie 2a vice lecta est Billa, intituled, "An Act for enlarging the Term and Powers of Two Acts of the Twelfth of King George the First, and of the Third of His late Majesty, for repairing several Roads therein mentioned, in the County of Salop; and also for amending and widening the Road from the Sign of The Horse Shoe in Uckington to Longnor Green, and also from the West End of Hatcham Bridge to The Cross Houses upon the Bridgenorth Turnpike Road in the said County." Hodie 2a vice lecta est Billa, intituled, "An Act for dividing and enclosing the Common Fields, Common Pastures, Common Meadows, Common Grounds, and Waste Grounds, of and in the Manor and Parish of Everdon, otherwise Great Everdon, and Little Everdon, in the County of Northampton." 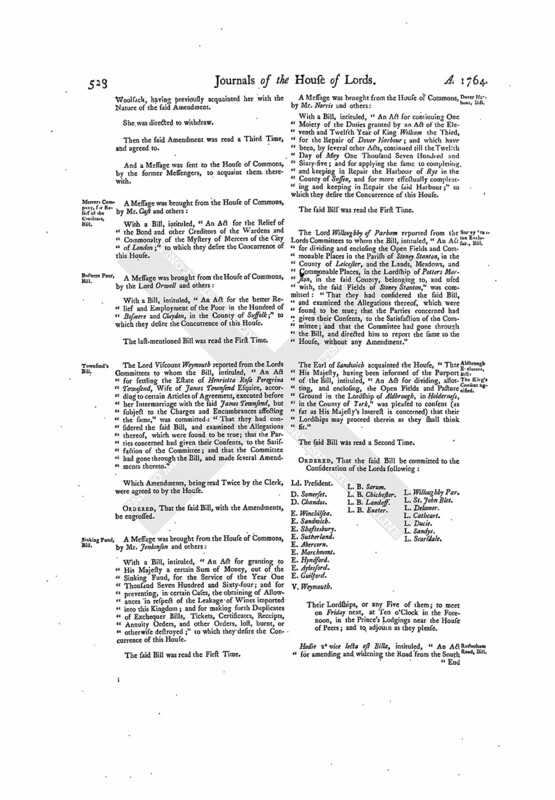 The House (according to Order) was adjourned during Pleasure, and put into a Committee on the Bill, intituled, "An Act for granting to His Majesty a cer tain Sum of Money, out of the Sinking Fund, for the Service of the Year One Thousand Seven Hundred and Sixty-four; and for preventing, in certain Cases, the obtaining of Allowances in respect of the Leakage of Wines imported into this Kingdom; and for making forth Duplicates of Exchequer Bills, Tickets, Certificates, Receipts, Annuity Orders, and other Orders, lost, burnt, or otherwise destroyed." Beaver Skins, to repeal the Duties on, Bill. With a Bill, intituled, "An Act for repealing the Duties now payable upon Beaver Skins imported, and for granting other Duties in Lieu thereof; and for granting certain Duties upon the Exportation of Beaver Skins and Beaver Wool, and for taking off the Drawback allowed on the Exportation of such Skins;" to which they desire the Concurrence of this House. Alexander Joseph Poittier took the Oaths appointed, in order to his Naturalization. Hodie 2a vice lecta est Billa, intituled, "An Act for naturalizing Alexander Joseph Poittier." Dominus Cancellarius declaravit præsens Parliamentum continuandum esse usque ad & in diem Lunæ, secundum diem Aprilis jam prox. sequen. hora undecima Auroræ, Dominis sic decernentibus.